UC Health Stadium-Florence, KY: I sat at my desk at work last Friday night, keeping an eye on the score on the computer, hoping the Florence Freedom would pull it off. 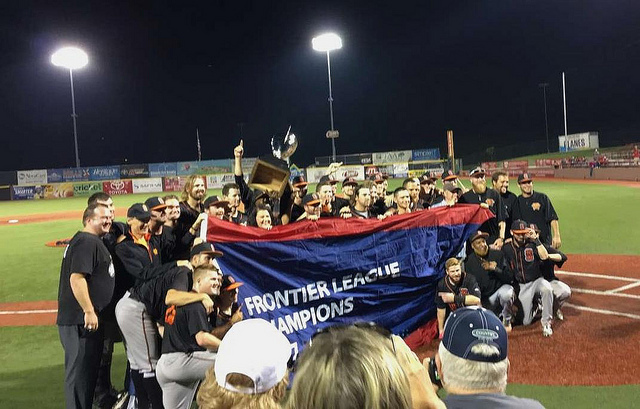 Already down two games to none, another loss would mean the series would be over, and the Schaumburg Boomers would be champs of the Frontier League. Worse for me, it would mean no baseball game to attend the next day. Lucky for me, and the Freedom, I guess, Florence prevailed in 12 innings to keep the series going. So Saturday night, Brian and I made the trip up to see what could be a championship for the Boomers, or another game for the Freedom. I was a little shocked to see the game tickets at $20 a piece, even for a championship series. You’d think the home team would really want the local fan base to fill the park (not a huge crowd for such a big game…). At least Brian was able to get a photo op with Y’All Star as soon as we entered the stadium. About this time we needed a treat, so Brian landed on the Funnel Cake Deluxe. 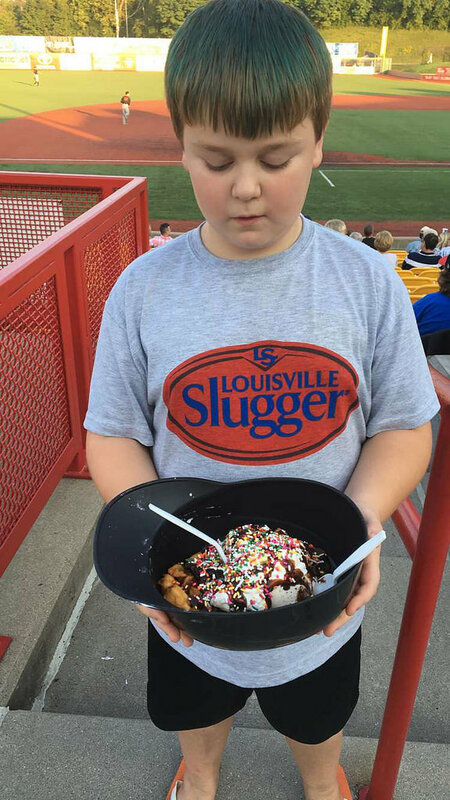 This was served in a helmet, and consisted of a funnel cake, a crap load of ice cream, whipped cream, sprinkles and Oreo pieces. It was amazing, and both of us together couldn’t even finish it! 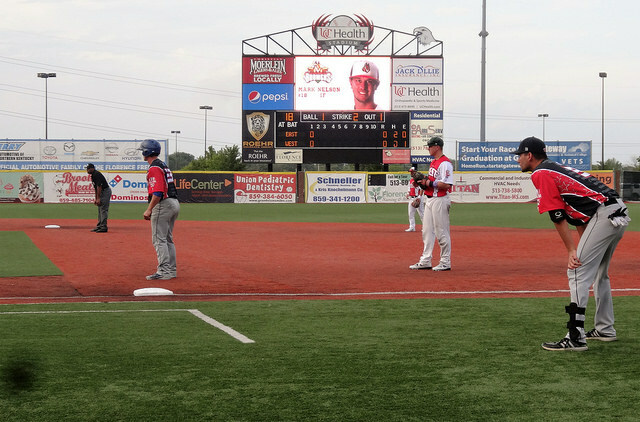 The sixth inning added more runs for Schaumburg. 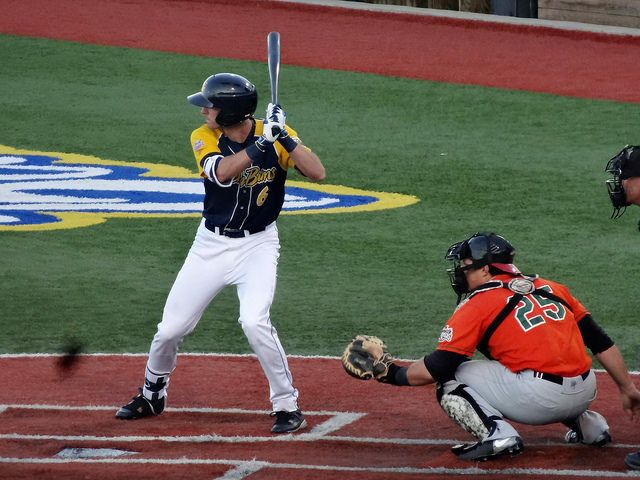 They hit another home run, and a sacrifice fly scored another to take a commanding 6-1 lead in the game. 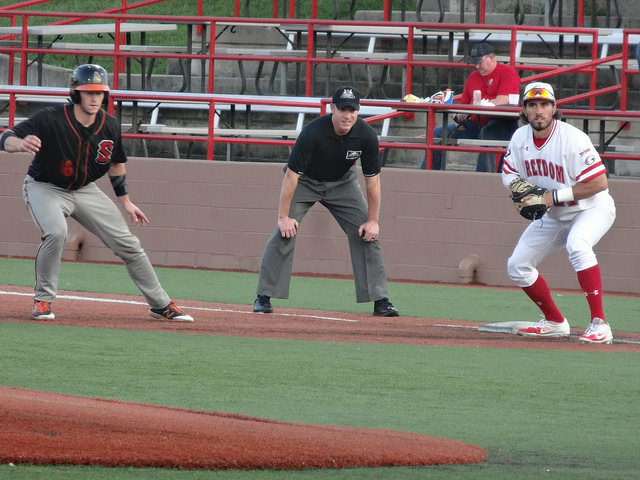 Florence came back with a two-out run in the bottom of the inning, to cut the lead to 6-2. 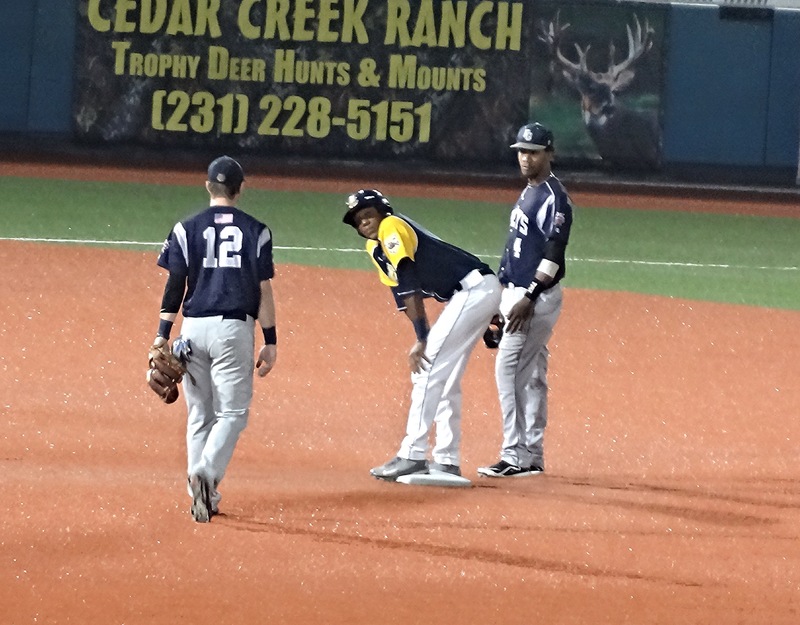 Andrew Godbold paced the offence for the Freedom, going 2-3 with a run scored. 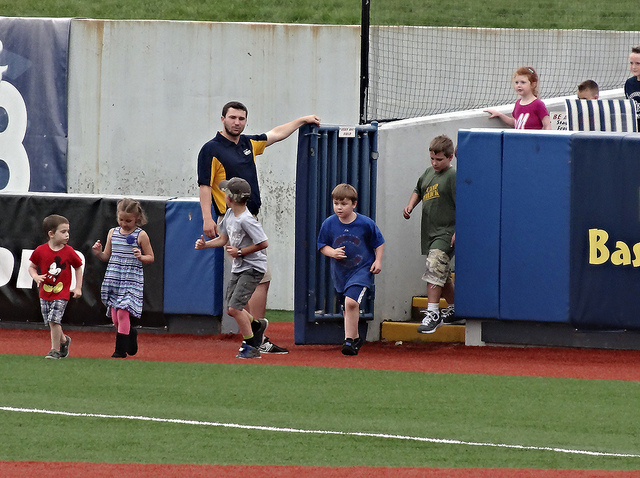 Between innings, Brian was supposed to participate in an on-field race, but back out once he learned he would be wearing over-sized underwear… Oh well, at least he did run across the field during the seventh inning stretch. 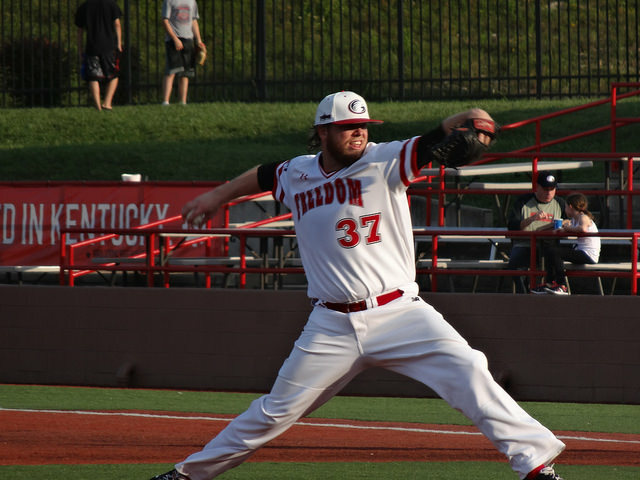 On the mound for Florence, Cody Gray got the start and took the loss. 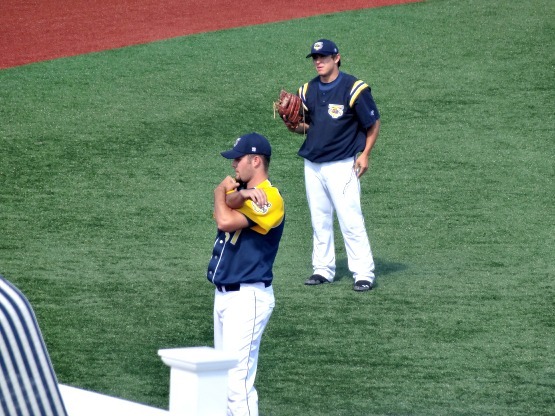 He tossed four innings, giving up four runs on seven hits, while striking out six. 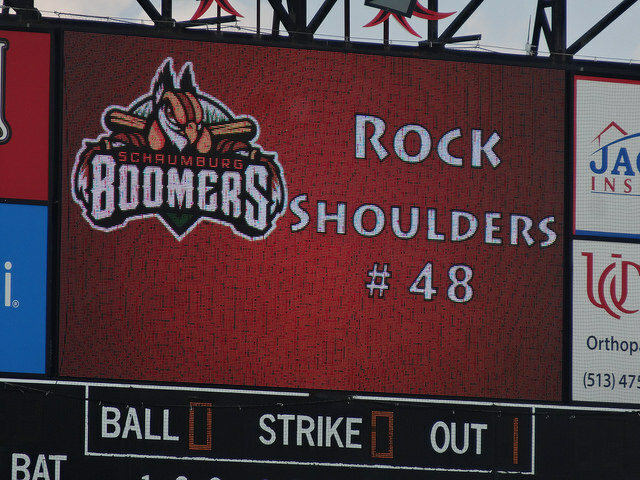 He would be replaced by Tony Vocca, who gave up two runs on two hits in 1.1 innings of work. 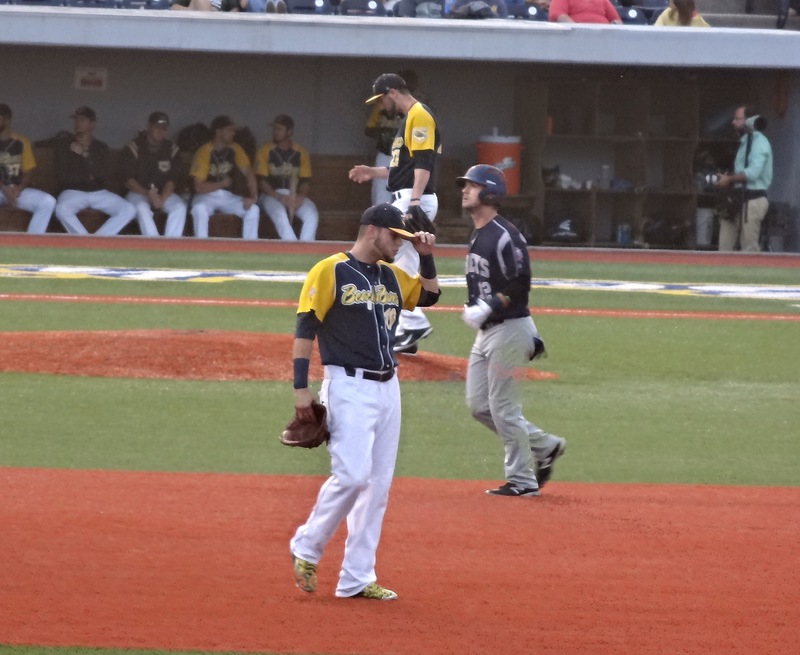 Kit Fowler started for the Boomers, pitching three innings and giving up a run. 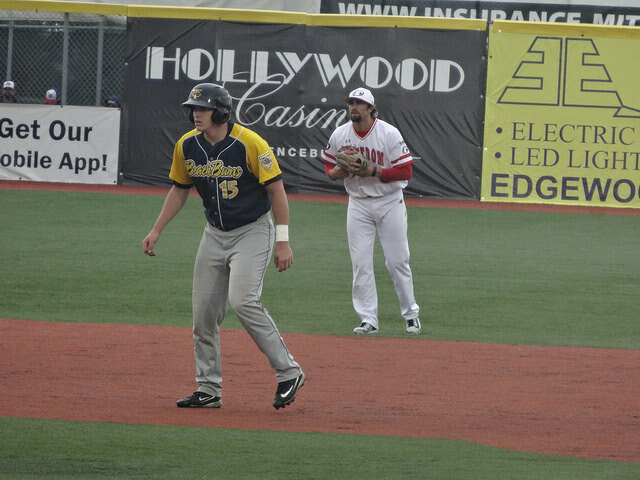 Michael Wood would earn the win, tossing 4.2 inning, giving up one run and striking out four. 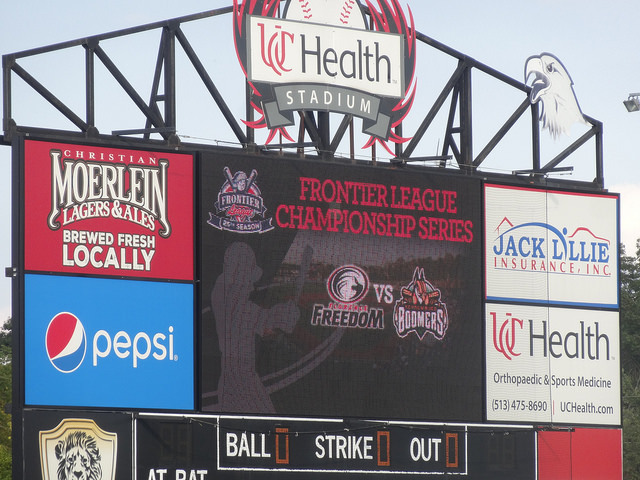 FINAL: Freedom 2, Boomers 6. 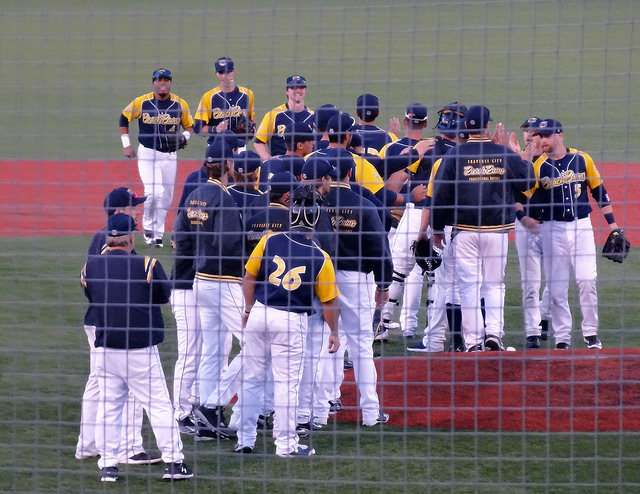 After the final out, it was time for celebration for the Boomers. 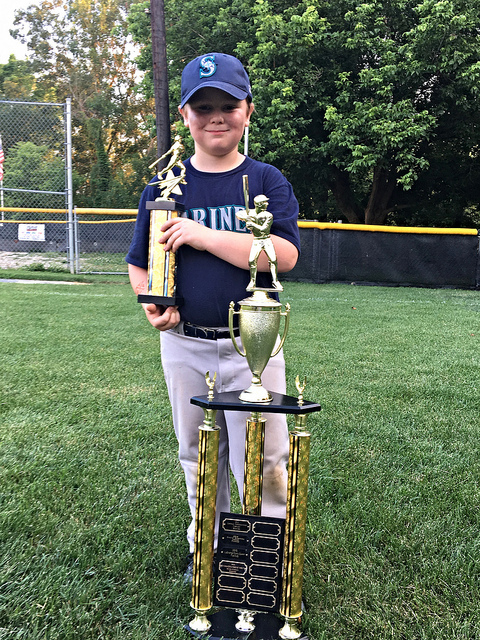 I don’t care what age you are or what level of ball you play, when you win a championship it is a big deal. Congratulations to Schaumburg, they definitely deserve it. 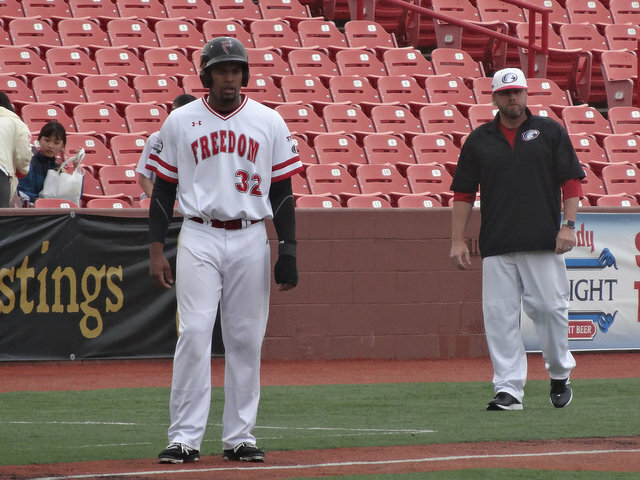 And congratulations to the Florence Freedom on a great season also. 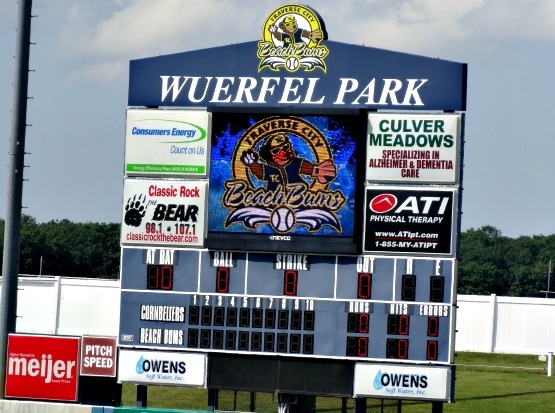 We’ll be back at UC Health Stadium next season. 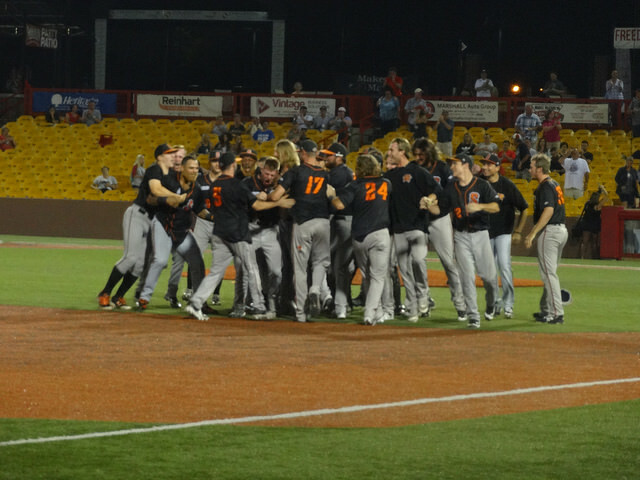 As Brian likes to celebrate with winners, I found him out on the field celebrating with the Boomers! A few of the players were nice enough to take a photo with him. 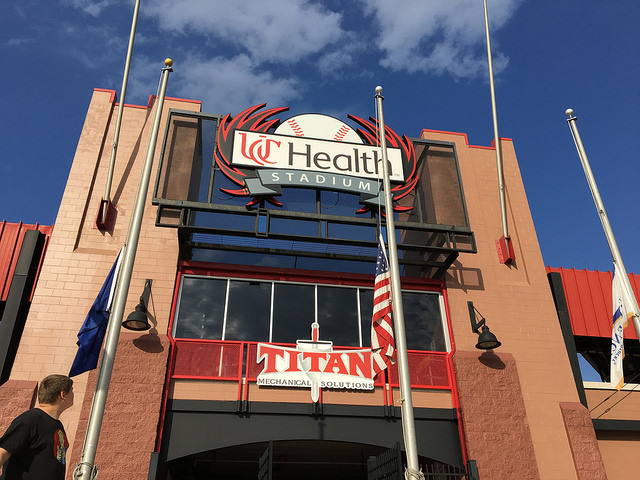 UC Health Stadium-Florence, KY: Second double-header in as many days due to a rain-out the night before. Again, because I’m so far behind, I’ll be combining both games into one post. 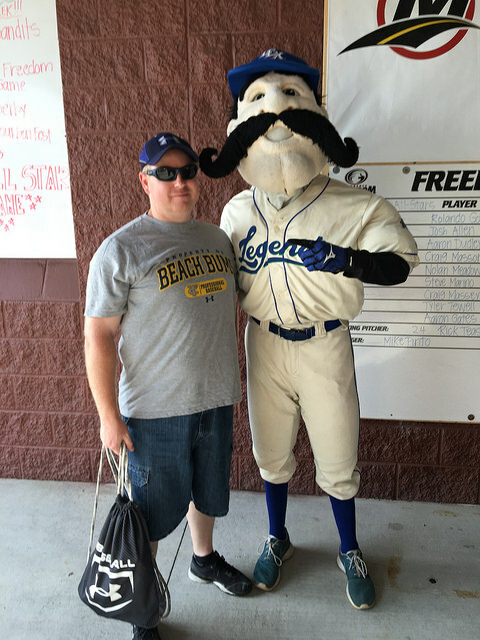 We settled in to see the Freedom take on one of my old teams from Michigan, the Beach Bums. My dad was pulling for TC all the way, but I was torn a bit (or more accurately, didn’t really care much as long as I was watching a good game). 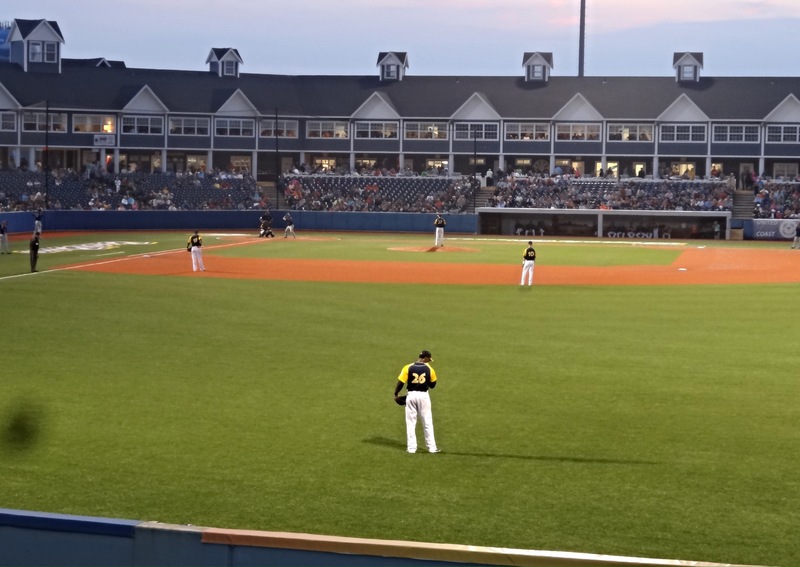 The stadium in Florence is nice, and usually has a pretty baseball savvy crowd, with Cincy just across the river. It was another game without much of a crowd, however, mainly due to the possibility of rain. The first game was a close one, and one my dad was happy with the outcome of. 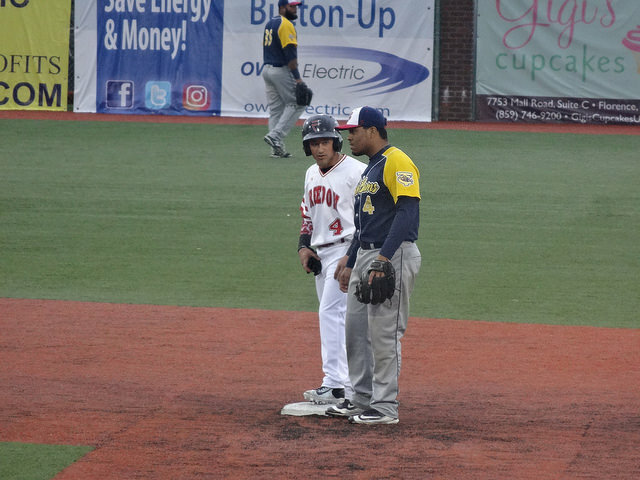 Leading Florence offensively was Daniel Fraga, who went 2/4 with two runs scored. 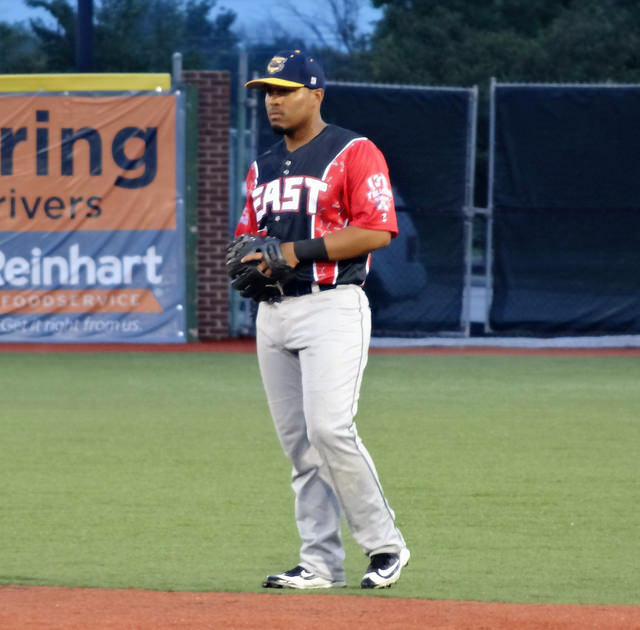 Jose Brizuela drove in four of the Freedom’s five runs, and also went 2/4. 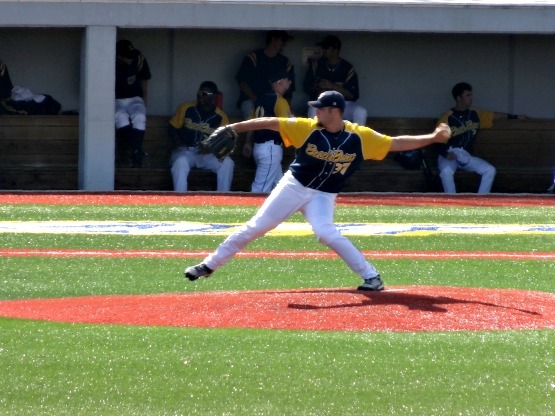 On the mound, Tony Vocca took the loss, pitching 5.1 innings of the shortened game. He gave up all six runs on ten hits, while striking out five. FINAL (7) game 1: Freedom 5, Beach Bums 6. 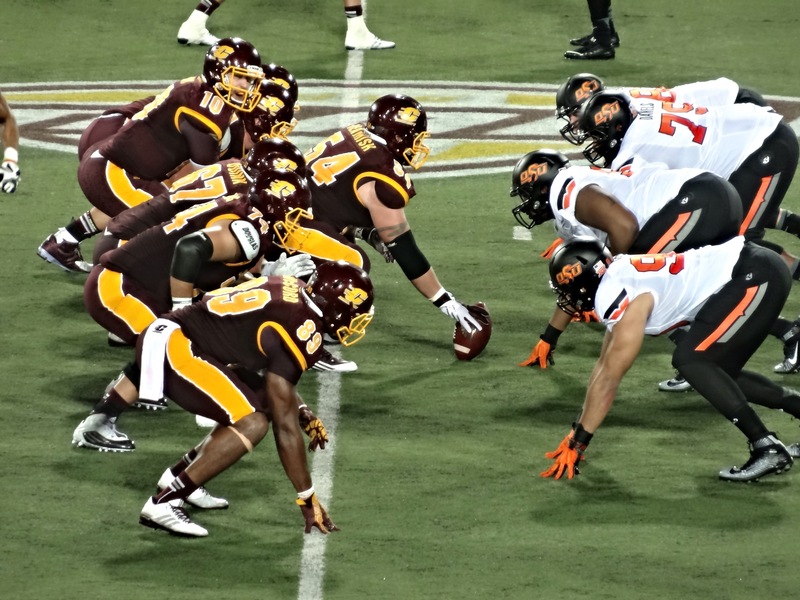 In the second game, the home team was able to even the score. 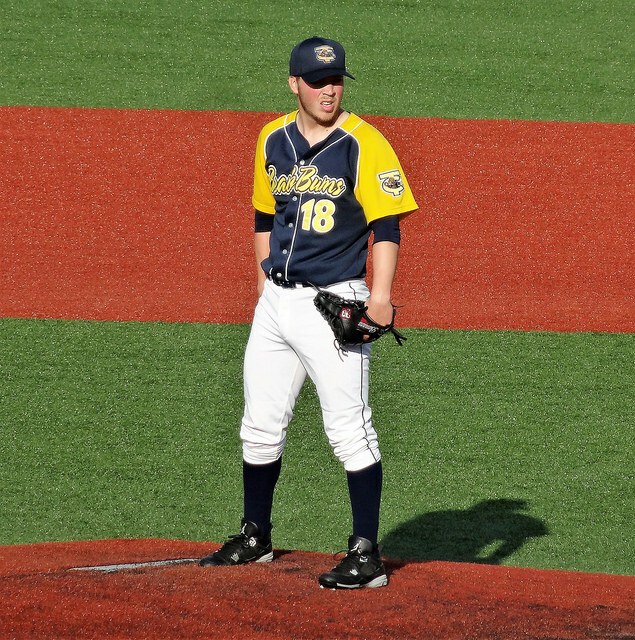 On the bump for the Freedom Cody Gray pitched all seven innings, only allowing three hits and striking out seven. 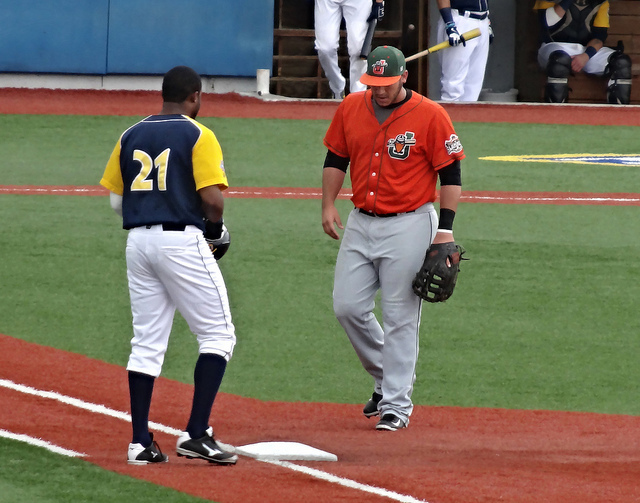 He was helped on the offensive side by Andre Mercurio, who went 3/3 with an RBI. Jordan Brower pitched in going 1/2, also. FINAL (7) game 2: Freedom 4, Beach Bums 1. 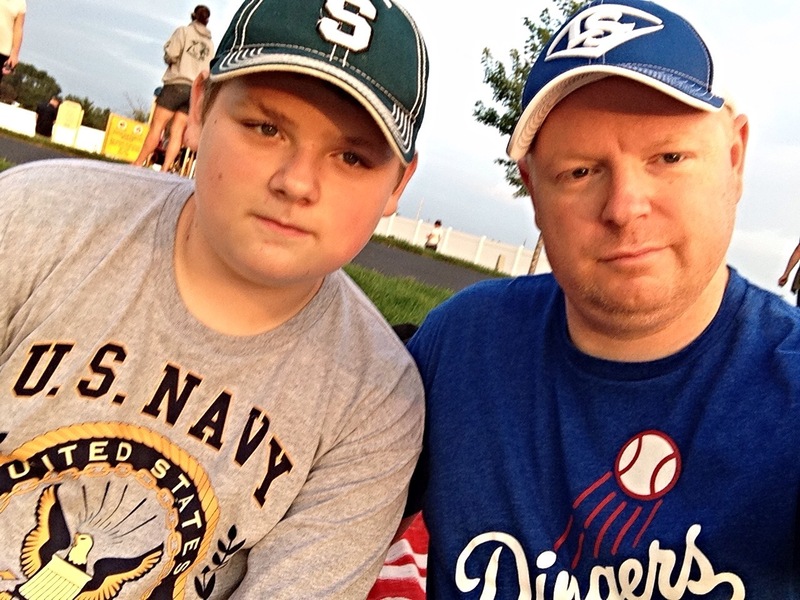 It was a fun night of baseball, and really the seven inning games move along pretty quickly. 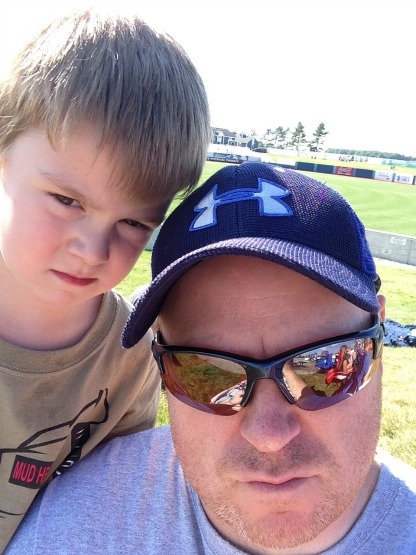 We enjoyed the ballpark and I still would like to get the kids up here for a family Sunday game. 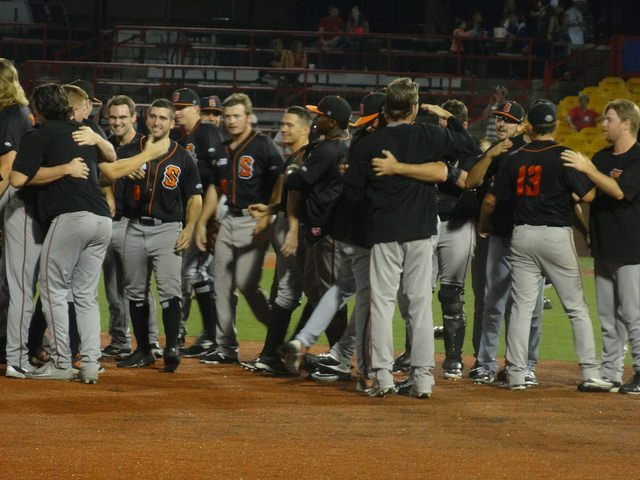 The next posts will be starting the games at the ACC Tournament, and I’ll also use some space to plug my social media, as you can follow on Twitter, Instagram, and Snapchat @minorbaseball. You can see real time photos instead of having to wait for me to finally get all of these posts up! 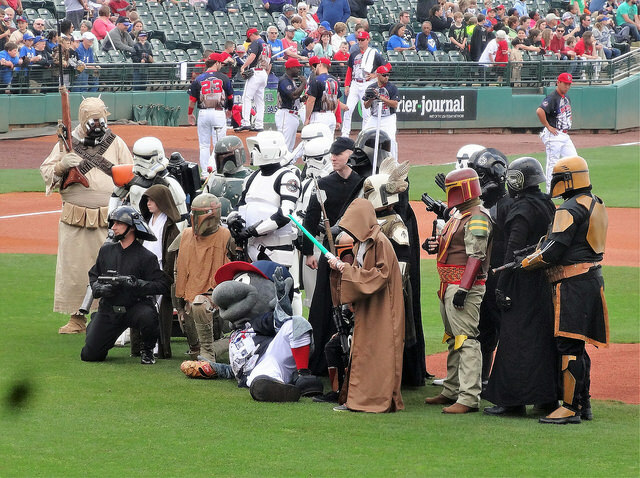 9) Star Wars Night: Star Wars will always be a hit, and this year we went to the event at our new home field in Louisville. 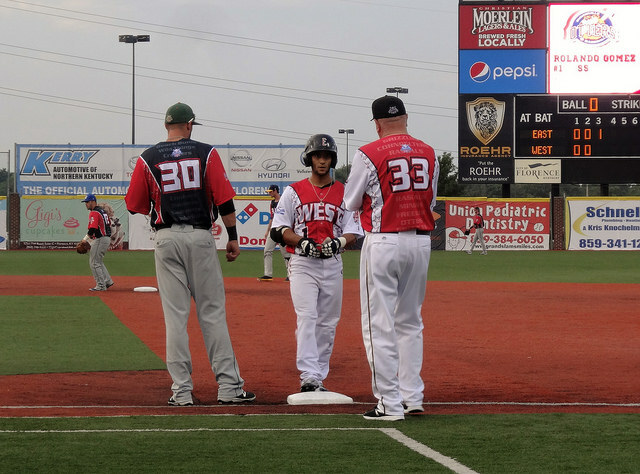 The Bats host a decent night of space adventure fun, and the game itself was a walk-off win. Even Boba Fett was there, who we missed last year, so it capped off a great night. 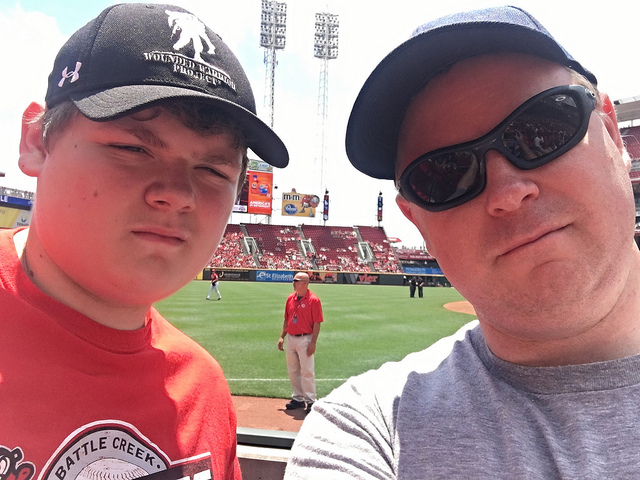 8) Our first Reds game: Our first Cincinnati Reds game was a great experience. We took a boat from Newport across the river to avoid traffic and parking, and that avoided a lot of my stress of visiting a Major League game. We got great seats off of Seat Geek, so we were able to get a great view of the game, and Brian got a game ball from Eugenio Suarez. It was a hot day, but worth it to take in the Great American Ballpark in all it’s glory. It’s an amazing place to watch a game, and although the Reds had a rough season, the games are always fun! 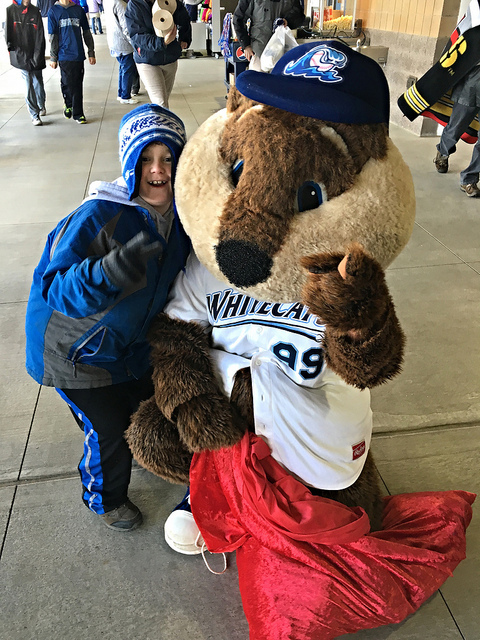 7) Whitecaps Opening Day: Opening Days are always fun, even if there is snow on the ground, and the temps are more suited for hockey. We wanted to get a Whitecaps game in before the move, and give my dad a fun birthday present at the same time. Despite the cold, we had a great time together, and every trip we make back to Michigan during the season, we will always try to work in a Whitecaps game. In a strange way, the weather was a fitting ‘goodbye’ for us. 6) Our first Cards game: Sometimes you go someplace that just feels like ‘home’. That’s exactly what happened to us when we entered Jim Patterson Stadium for the first time in early March. 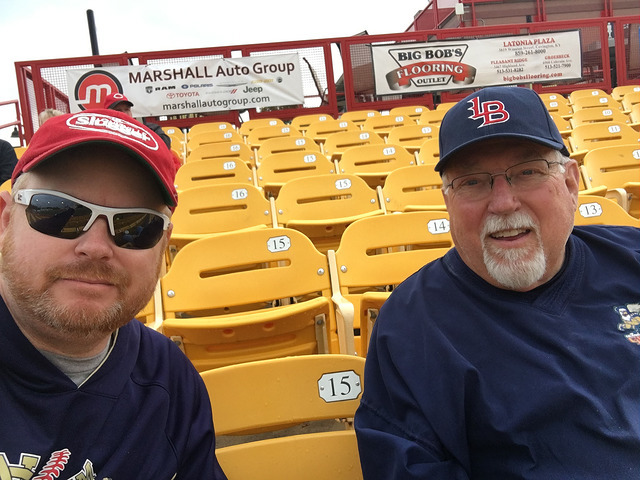 Before Minor League opening day, and while down doing some house hunting, we couldn’t resist taking in a ball game. 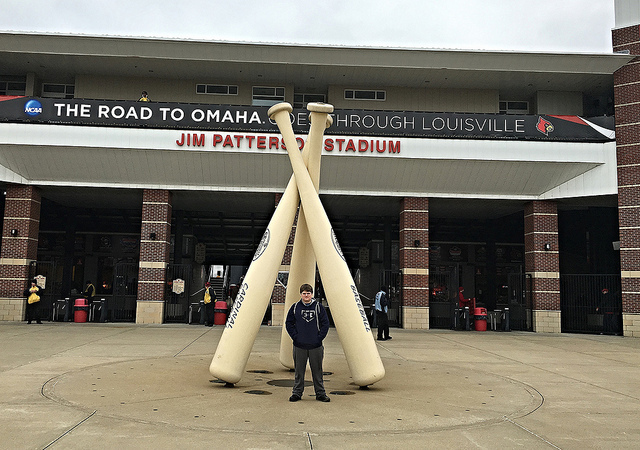 This is a great venue, and the Louisville Cardinals have a good baseball program, so this was a fun game for sure. It’s hard to believe the games are free with the ACC being such a competitive conference, so no surprise they pull in some good crowds. With my love for college baseball growing with every game, Cardinal baseball will be a staple in our lives for years to come. 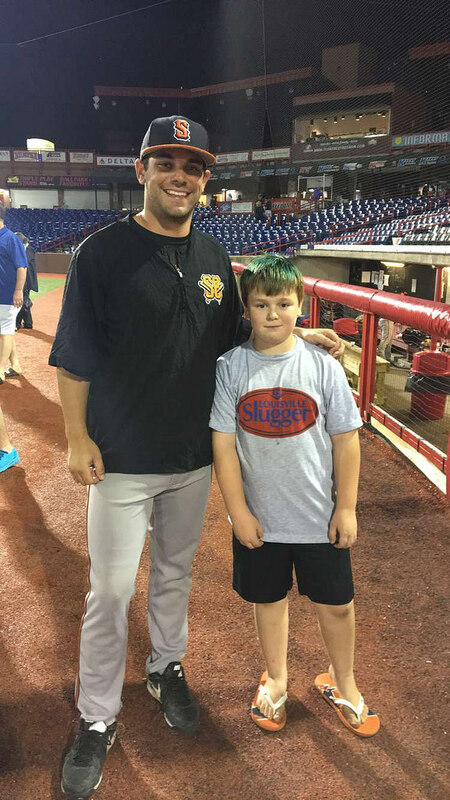 5) Y’All Star Game: We lucked out, as the Frontier League All Star, or Y’All Star, Game was held in Florence, KY this season. 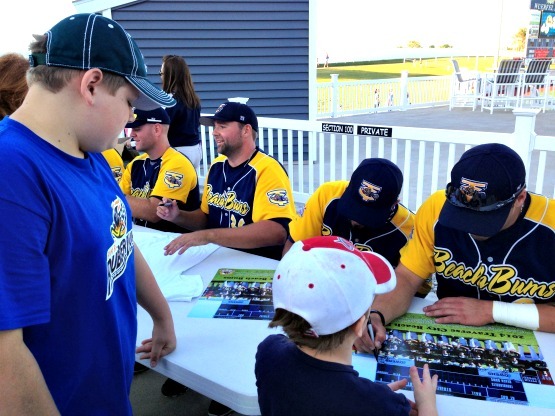 We’re pretty familiar with the independent Frontier League, spending some time at some of the Beach Bums games in Traverse City. 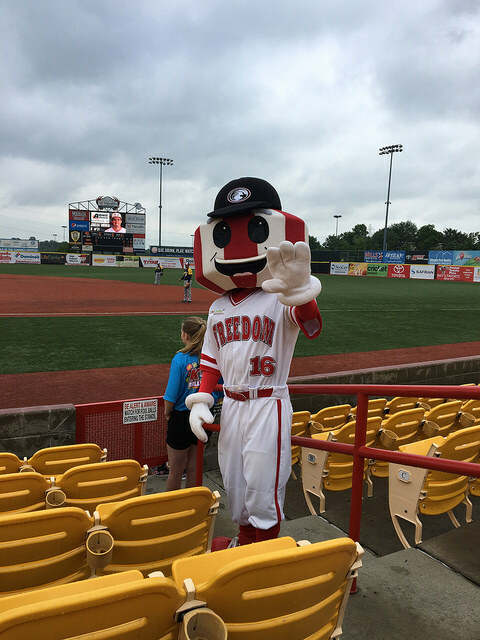 We were able to cheer on some of our Bums, as well as players from the home town Florence Freedom. 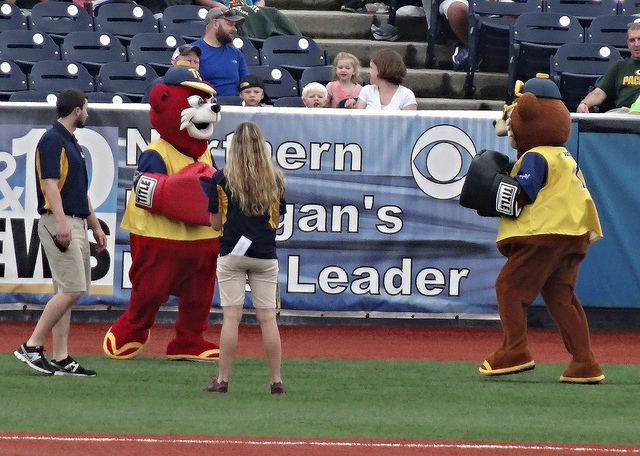 The game hosted mascots from the Reds and other Frontier League teams, as well as Jake the Diamond Dog, and Myron Noodelman who was absolutely hilarious. 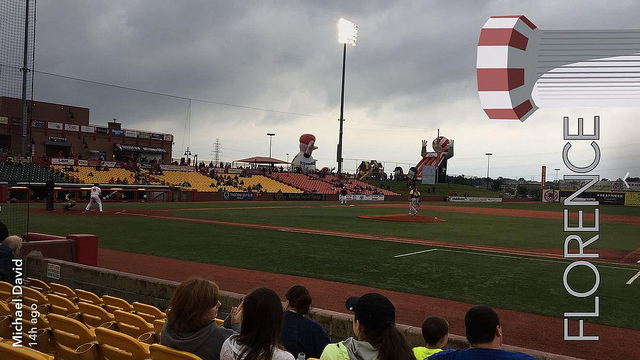 In all, just an enjoyable night of baseball, and we’ll definitely make it back to Florence for a Freedom game next summer. 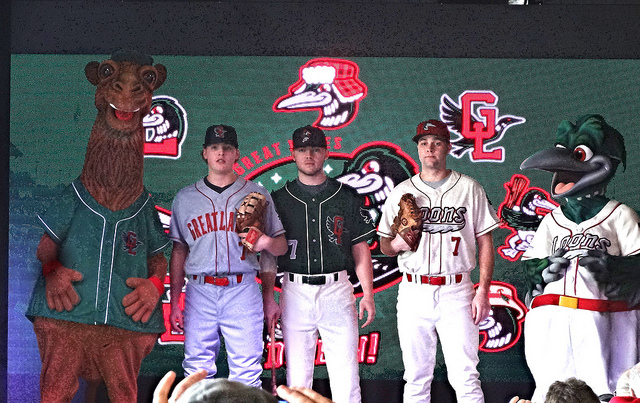 4) Loons Uniform and Logo Unveiling: It’s not too often you are able to enjoy a baseball event in February, but that’s just what we did when the Great Lakes Loons hosted an event to showcase the teams new logo and uniforms. 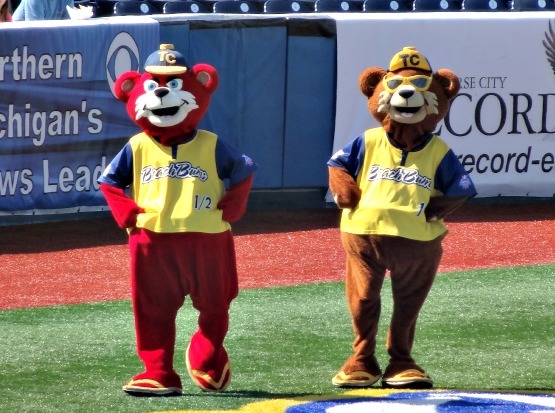 Along with seeing the new logos, the mascots Lou E. Loon and Ral E. Camel entertained us. Brian was able to get his face painted and took the mic to try his hand at announcing. We ended the day by taking some cuts in the batting cages under Dow Diamond. Not a bad way to spend a winter day. I also wanted to add, that the Loons took their new look all the way to the 2016 Midwest League Championship! 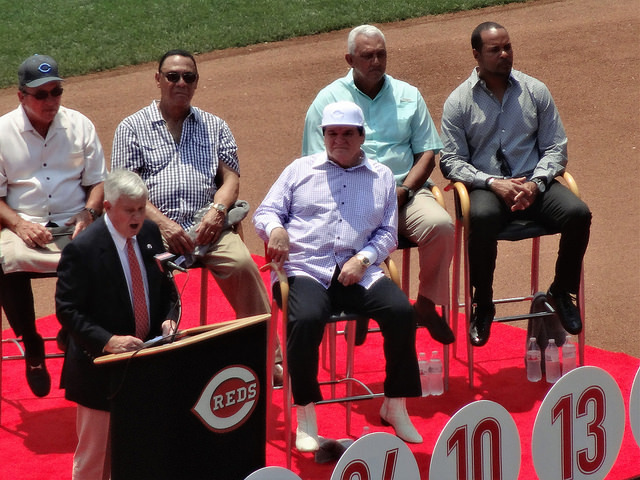 3) Rose Number Retirement: Everyone has an opinion on Pete Rose, and whether you love him, or hate him, he is without a doubt one of the best hitters in the history of this great game! 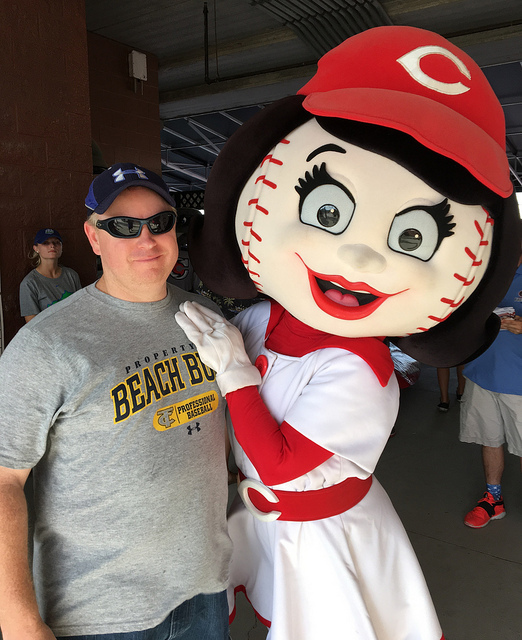 I met my best friend in Newport, and we had a great time at the ballgame, and seeing Reds legends like Rose and Johnny Bench in the pre-game ceremony. Like him or not, I did get to witness some history. 14 forever! 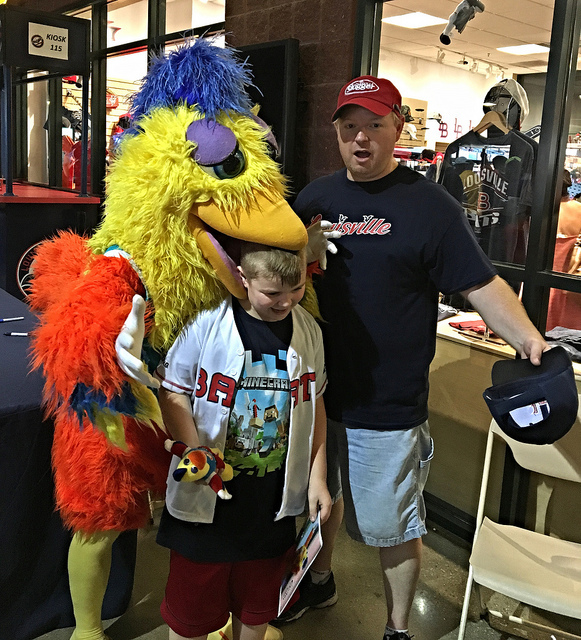 2) The San Diego Chicken! : Just like the afore mentioned Bench, I grew up watching the San Diego Chicken on the TV show The Baseball Bunch. 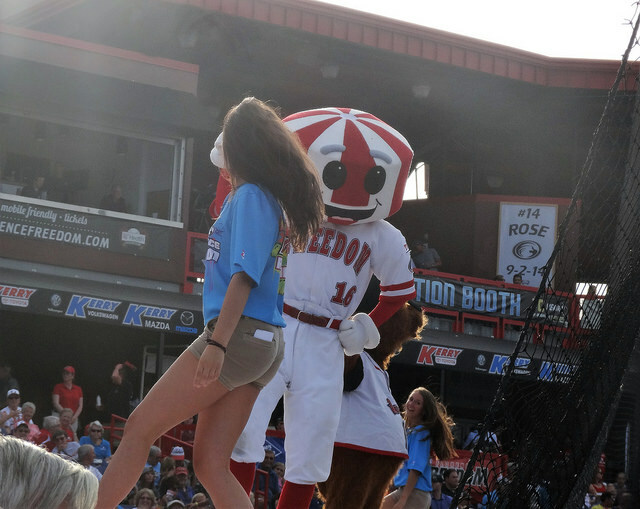 He is far and above other mascots, and the skits he puts on are flawless and amazing. The Chicken has a magical presence that keep both children and adults tuned in to his every move. He was nice enough to meet with all his fans, also, and definitely made another one in Brian. This was an amazing night at the Bats game with the Chicken. It’s all about the hardware! 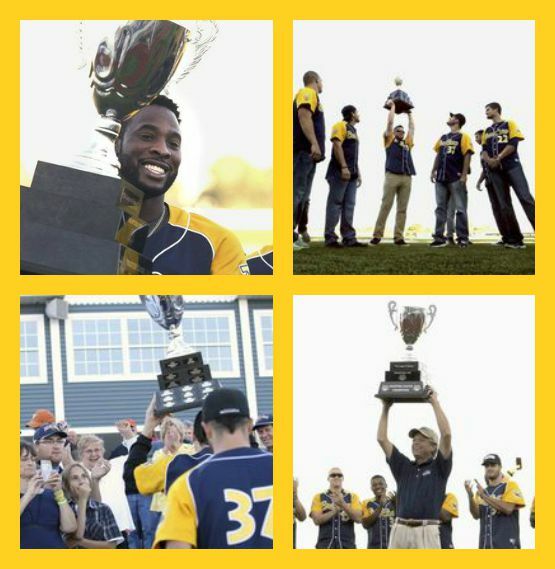 1) Mariners win the Championship! 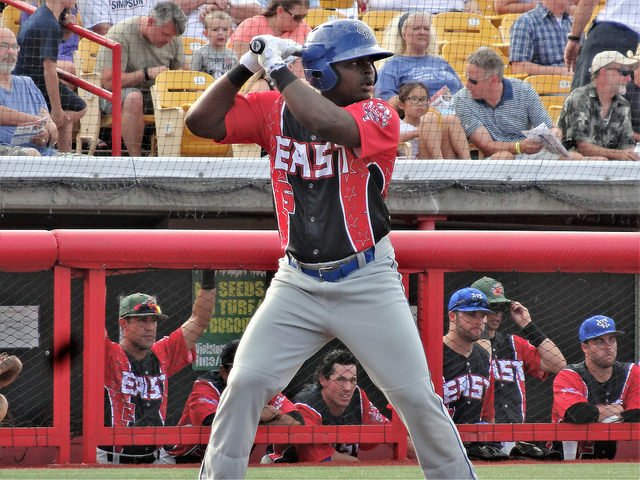 : Brian has really prospered from the move, but nothing more than what he’s been able to accomplish on the ballfield. He was lucky enough to join the Mariners a handful of games into the season when we moved down. The league down here is very different, and a lot more competitive. Brian fit right in, however, and had a great season at the plate. 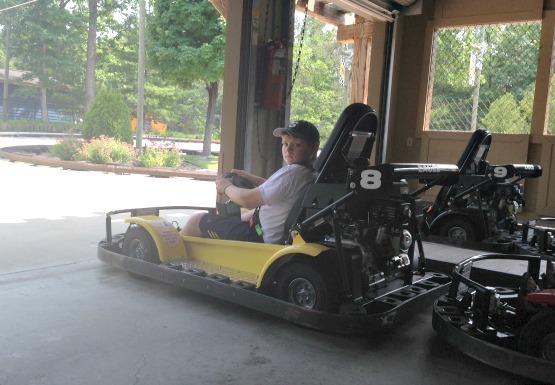 He was blessed with good coaches who pushed him hard but also let the kids have some fun. Being part of this team was a great experience and I’m glad he was able to be a part of it. The championship game was probably harder on me, but the kids were able to hang on for the win. Looking ahead to 2017: I’m really looking forward to next season, and the adventures that baseball will take us on. We’ll have a full season with the Cardinals and Bats to look forward to, and the ACC Baseball championship here at Slugger Field, also. Brian will be playing ball again so we’ll keep tracking his success as he moves up a level next season. 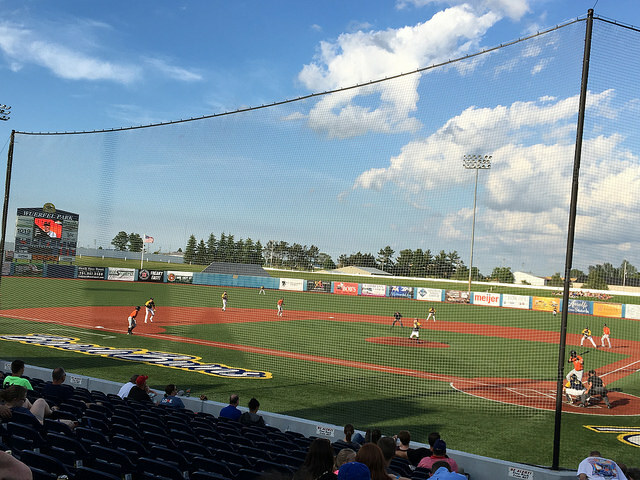 I’m looking forward to visiting new ballparks, especially some others here in Kentucky such as Lexington and Bowling Green. I wouldn’t mind hitting the road, either, for trips to Evanston, IN or Nashville, TN that aren’t all that far away, either. Until then, I wish everyone a safe and Merry Christmas! 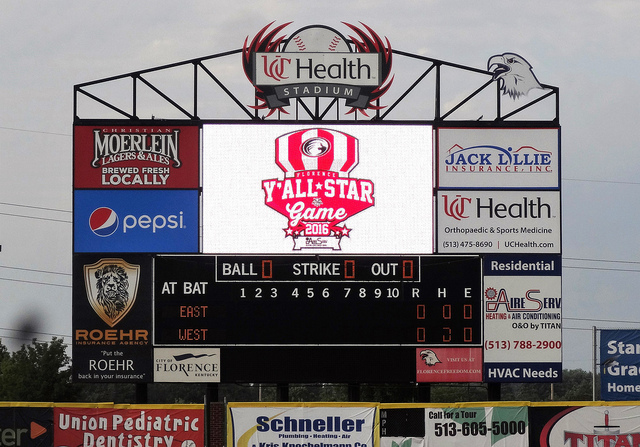 UC Health Stadium-Florence, KY: This week was the annual All-Star Game for the Frontier League, nicely dubbed Y’All-Star Game this season due to it being held down here in Kentucky. 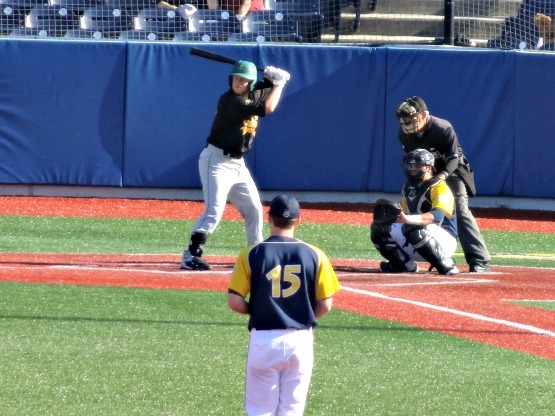 This was our first game in Florence, and in my opinion, they have a nice little stadium. When we entered, we were met with a barrage of mascots! 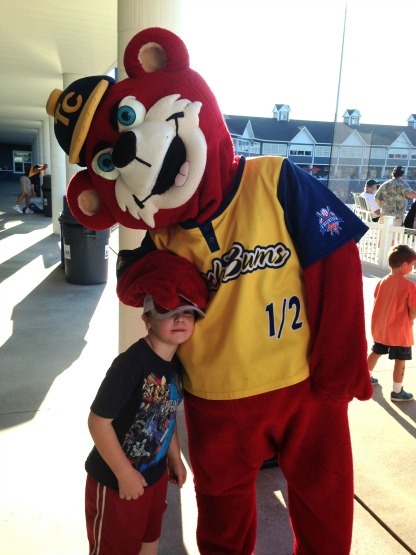 We got to meet Big L from the Lexington Legends (South Atlantic League), Wild Thing from Washington (Frontier League), and, of course the lovely Rosie Red from Cincinnati! My dream girl, Rosie Red! We had great seats in the front row, and I’m glad we didn’t sit behind the dugouts. 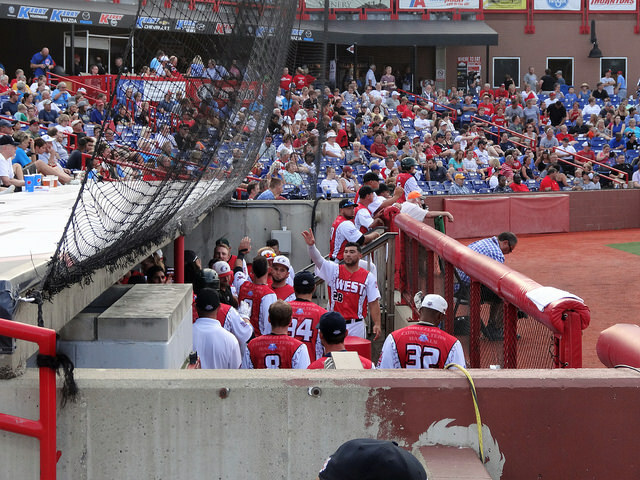 It’s my pet-peeve, and really the only negative about this ballpark is that the netting wraps all around the ends of each dugout, which doesn’t give a great view of the game. 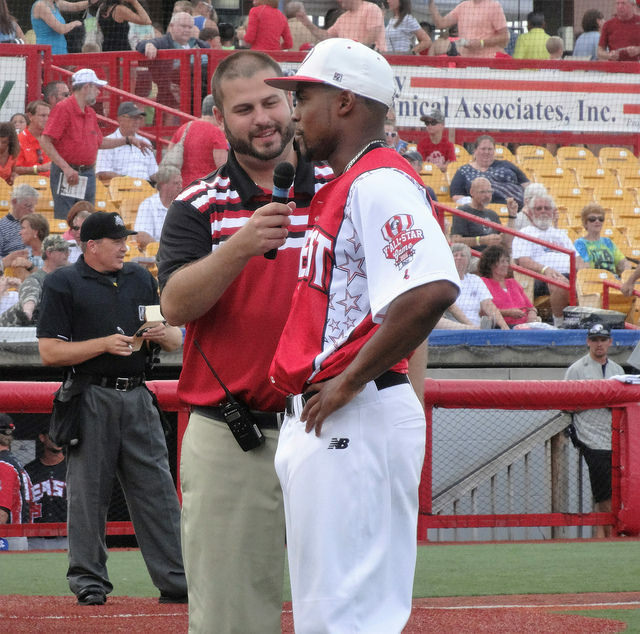 The Y’All-Star Game also had some guests, with Jake the Diamond Dog being the first. 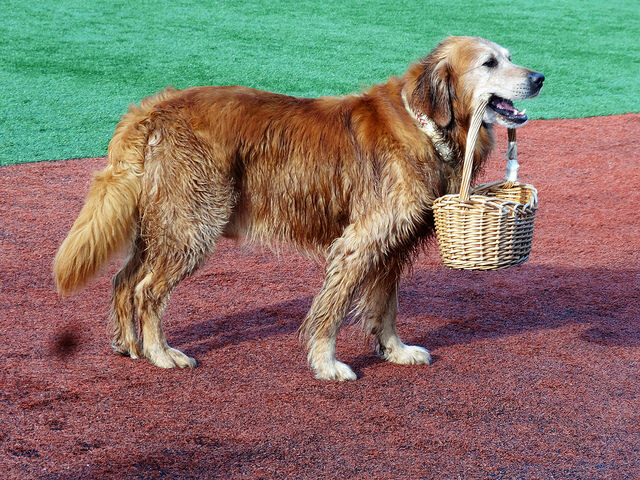 Other than being just a cute dog, he could fetch bats, balls, and brought the umps some water. 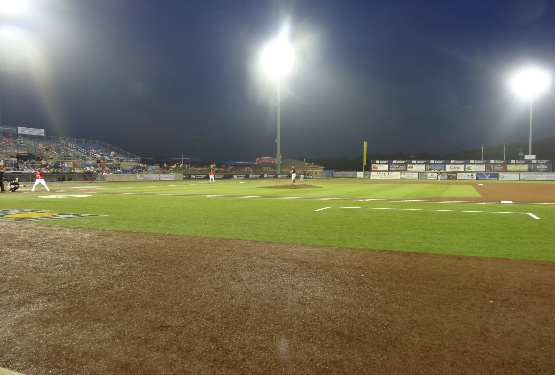 It started out as a pretty hot day, but as the game started we got a little cloud cover and a breeze that made it a perfect night for baseball. I tried to get some better photos while we still had sun-light, though. 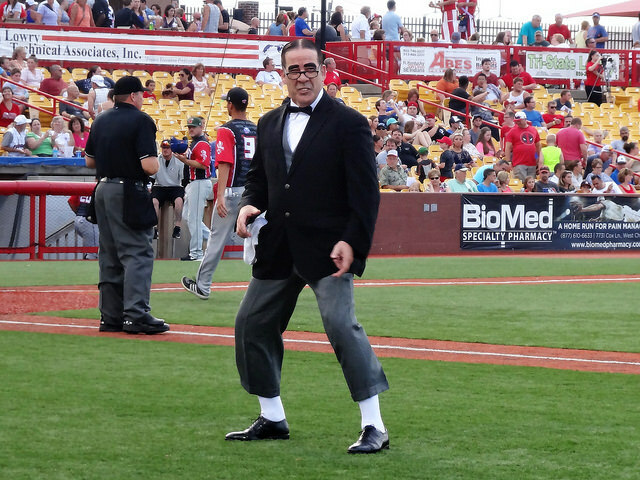 And here is the second special act of the night, Myron Noodleman, who was absolutely hilarious! 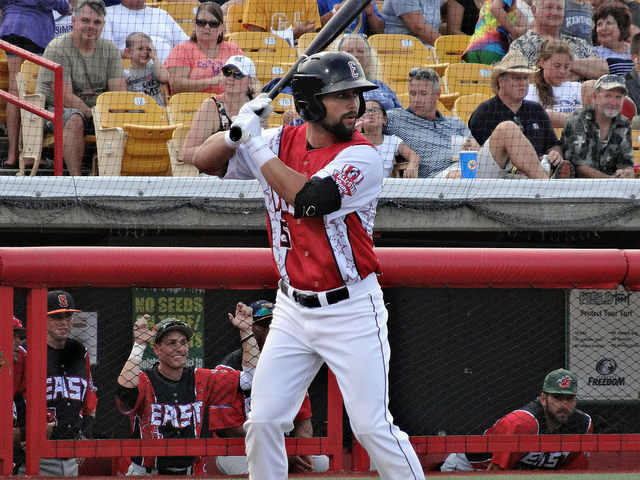 In the game that was going on, the East was actually winning 3-1 for most of the game, until the West hit their stride in the seventh inning. Here’s a quick video I did before the wheels fell off for the East. 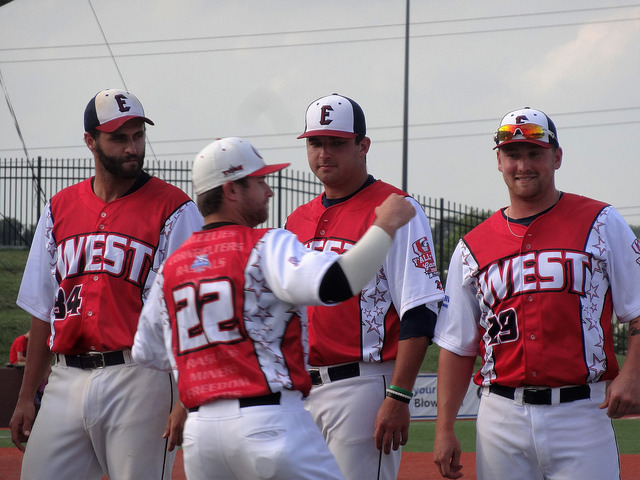 It was a huge inning for the West, as they scored seven in the seventh, with help from the Evansville Otter’s Nik Balog who hit a three-run blast to put his team in the lead. The West added on a couple of more runs, and the East just couldn’t get back into it. 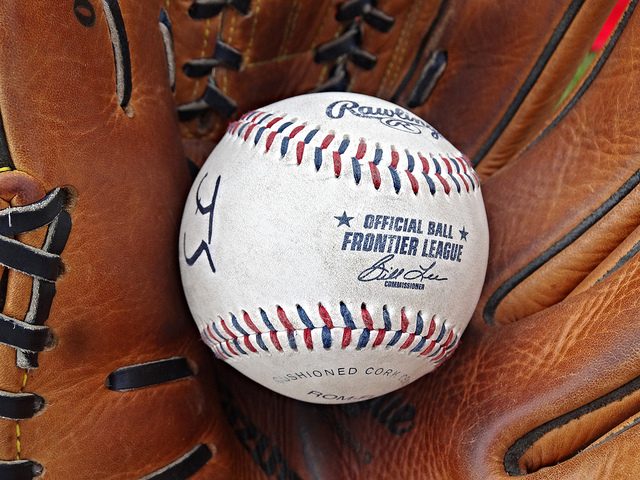 Sorry I don’t have more names and stats for the game listed, but if you’re interested you can read the full review from the Frontier League’s website HERE. 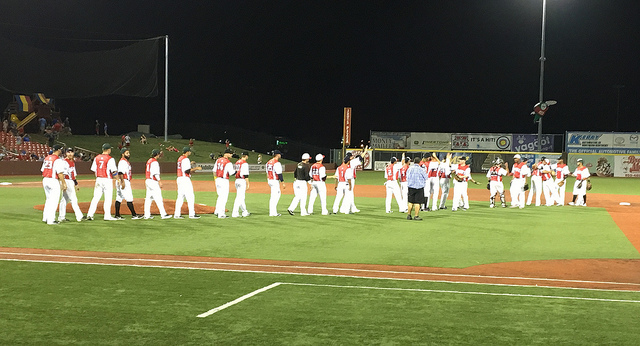 Below, the West celebrates their Y’All Star Game victory! FINAL: West 11, East 4. 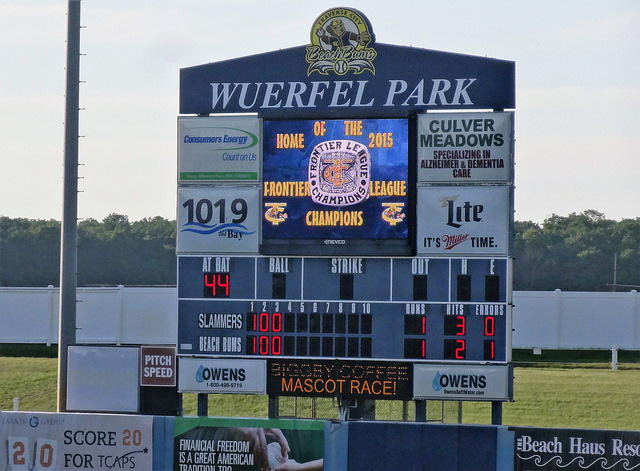 Wuerfel Park-Traverse City, MI: While back visiting family in Michigan, we decided to take in a Beach Bums game, the defending Frontier League champions. 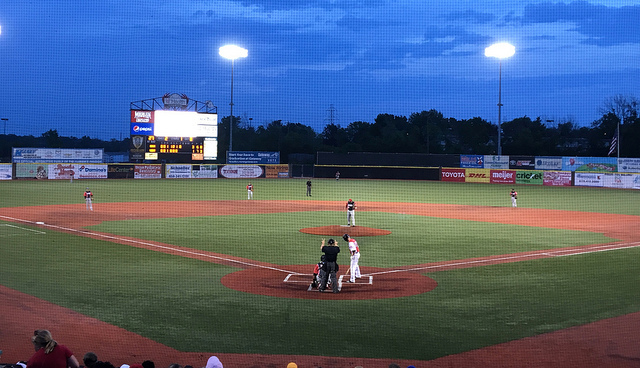 It seemed like we brought some of the southern heat with us, as the temps were pushing the upper 80’s, but the nice cool breeze off of Lake Michigan turned it into a perfect night for baseball. 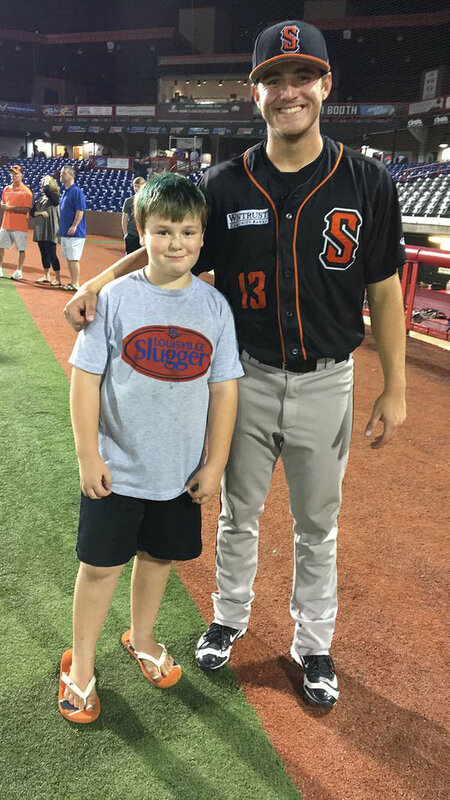 Brian remembered that the Slammers gave him a baseball last year, so he was actually rooting for the visitors. The way the game started out, I thought it would be a high scoring affair, but then the pitchers settled in, and the game moved by pretty fast. At one point, 10 Beach Bum players were retired in a row. 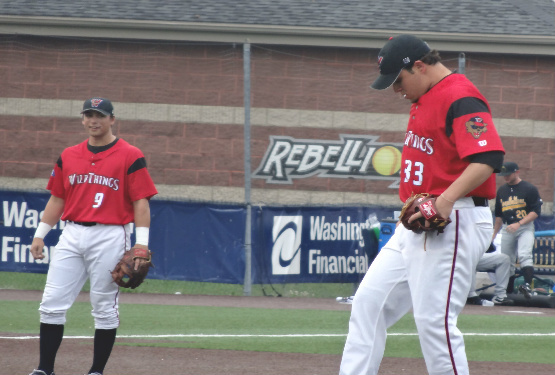 Lucky for TC, Jacob Lanning was on the mound, as he pitched a complete nine inning game for the win. He gave up only one run in the first inning, on seven hits, and he struck out two. 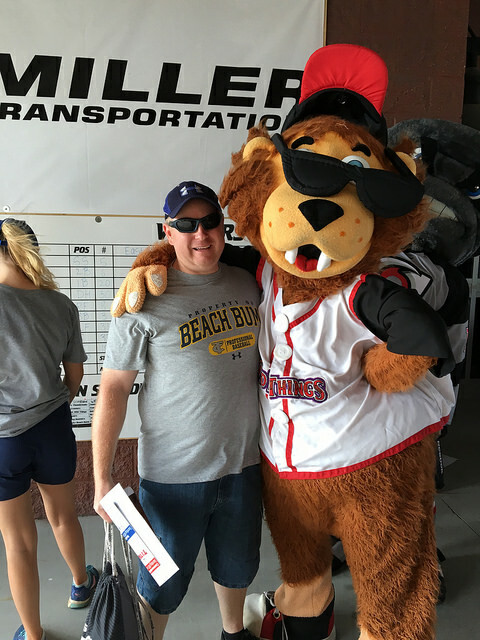 Also during the game, Brian was able to catch up with both Beach Bum mascots, Suntan and Sunburn. Be honest…doesn’t it look like the red bear is flipping me off??!! 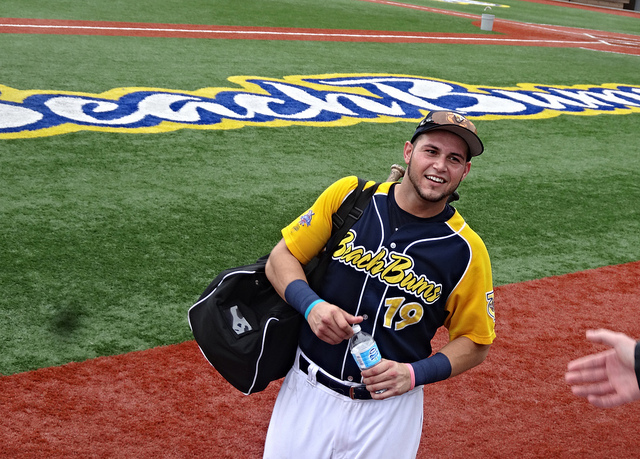 Anyway, the Beach Bums scored one run in the first inning on a Will Kengor RBI double that scored Jose Vargas. 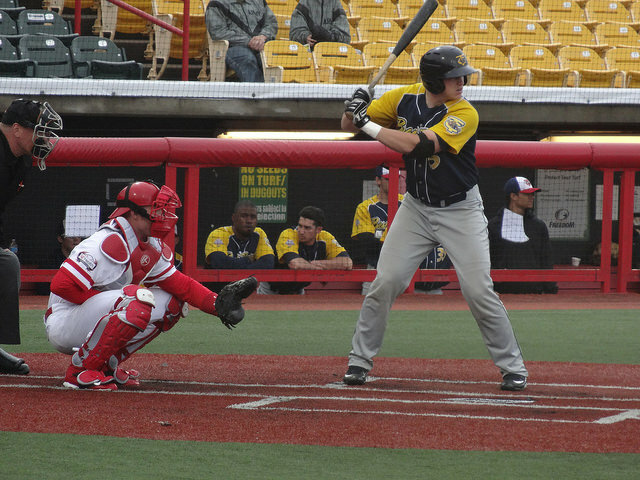 Then in the fifth inning, Jeff DeBlieux hit a double of his own, this time scoring two to put TC in the lead for good. It was good to be back in Michigan, if only for a few days, and I’m sure this isn’t the end of us enjoying some games up here. We look forward to our next game in Kentucky, though! 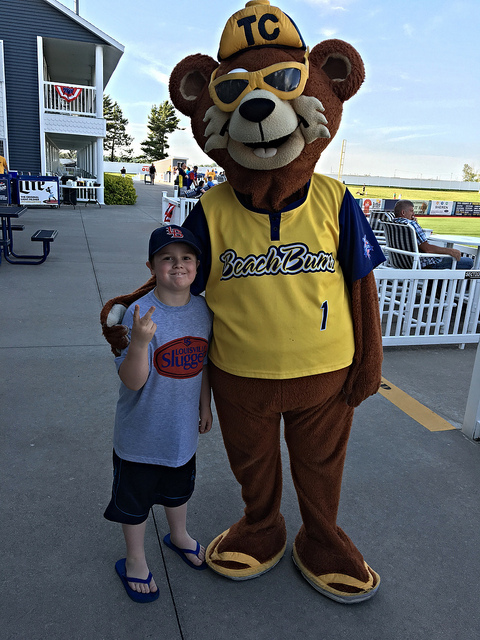 FINAL: Beach Bums 3, Slammers 1. 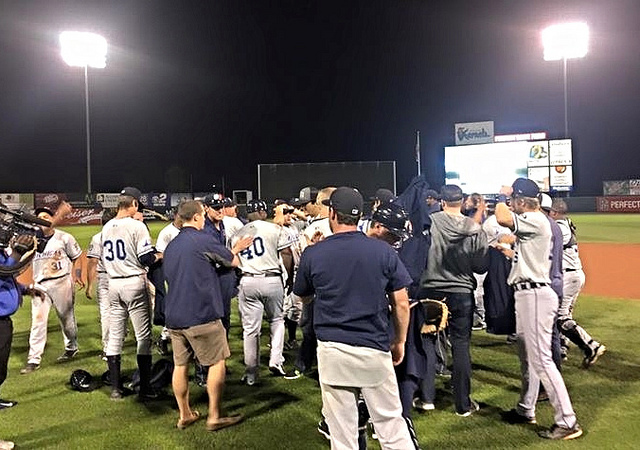 Monday night the Whitecaps held on to beat the Cedar Rapids Kernels 3-2 in a decisive game five to win the Midwest League crown. 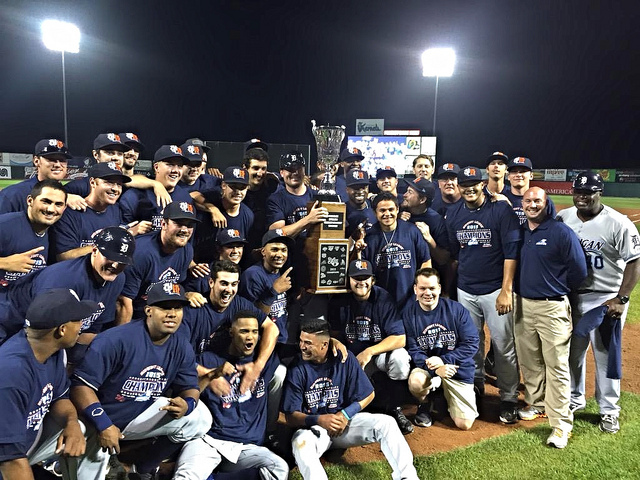 This is the teams first championship since 2007, but manager Andrew Graham won the title as a catcher for West Michigan back in 2004. The ‘Caps split the first two games at home, getting shut out 5-0 in game one, and coming back with a 4-1 win in game two (the one that we were at). 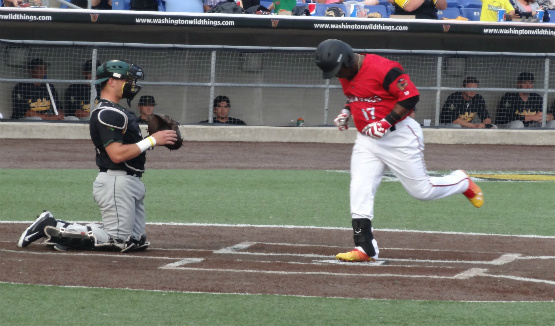 They dropped a heart-breaker in game three, when the Kernels earned a 3-2 walk-off win in the ninth inning. 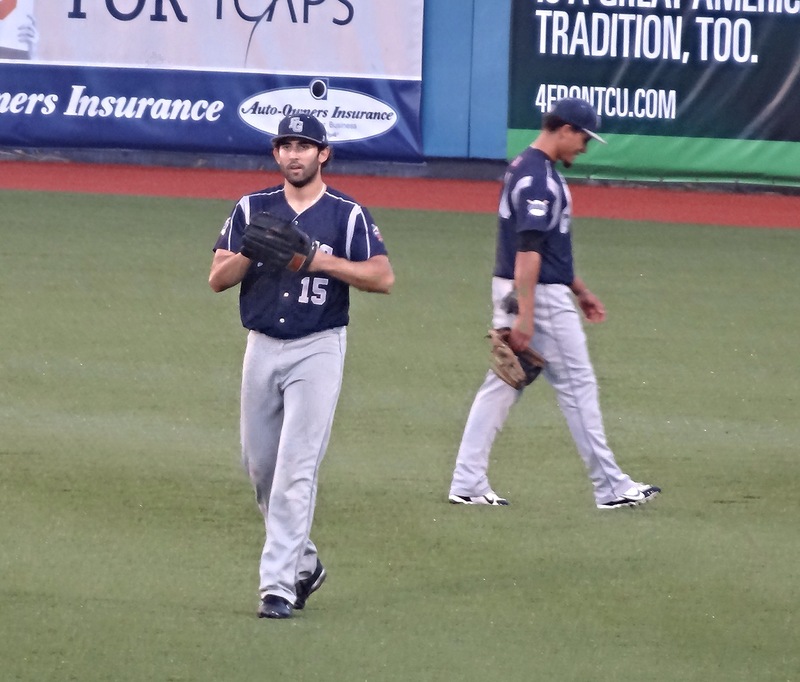 Never giving up, the Whitecaps held on to win game four 2-1 and game five 3-2, on the back of relief pitcher Joe Jimenez. 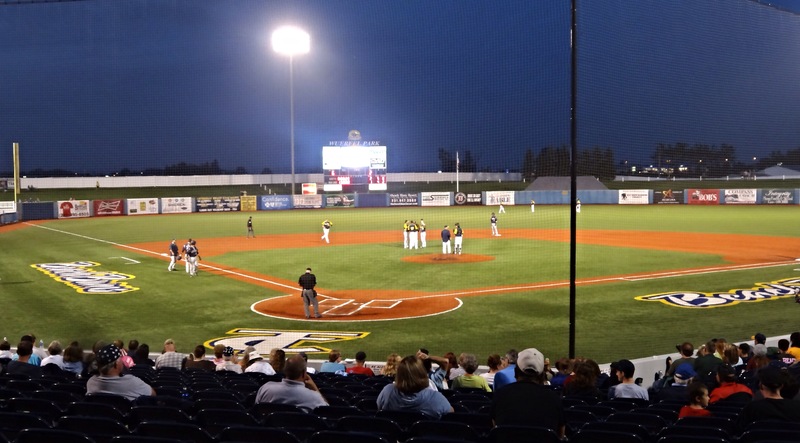 In the final game, Ross Seaton earned the win on the mound, holding the Kernels to only two runs. 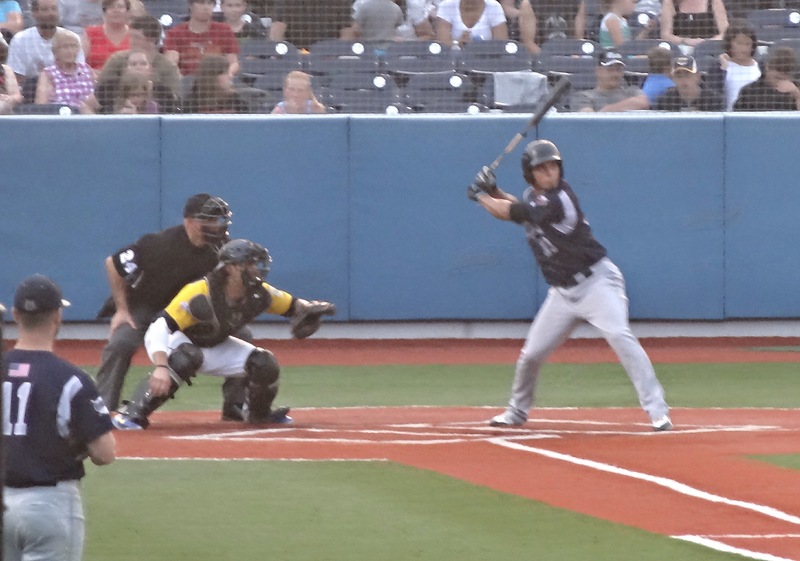 The Whitecaps scored their runs on RBI’s by Francisco Contreras and David Gonzalez, while the third run was scored by Contreras on a wild pitch. 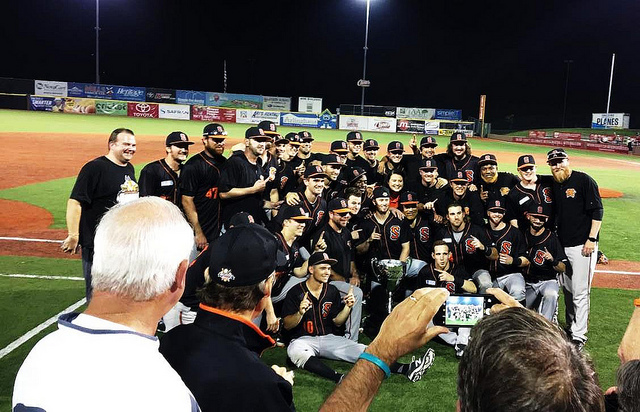 Jimenez struck out the side on the ninth inning to secure the victory, and championship! 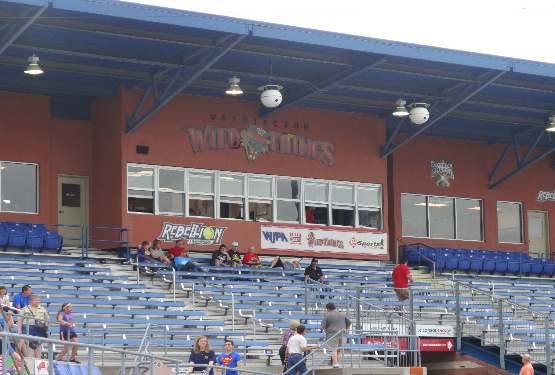 As memorable as this season has been, we were lucky to get down to a handful of games to see the Whitecaps play. With Larry Parrish retiring in Toledo, I fully expect Andrew Graham to be promoted, unless the Tigers’ organization brings in someone to take over just at the Triple-A level. I think he’s done a great job with this team the last two seasons, and wouldn’t mind him sticking around. 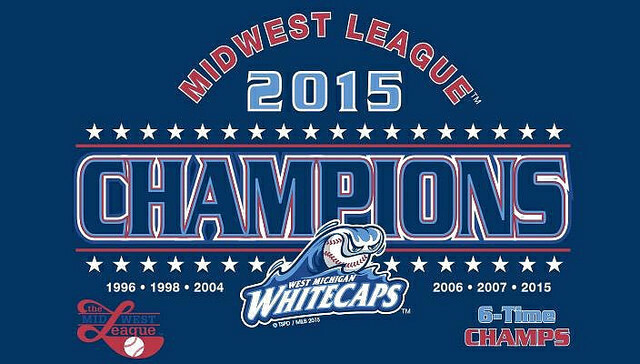 Congrats again, to the Whitecaps! 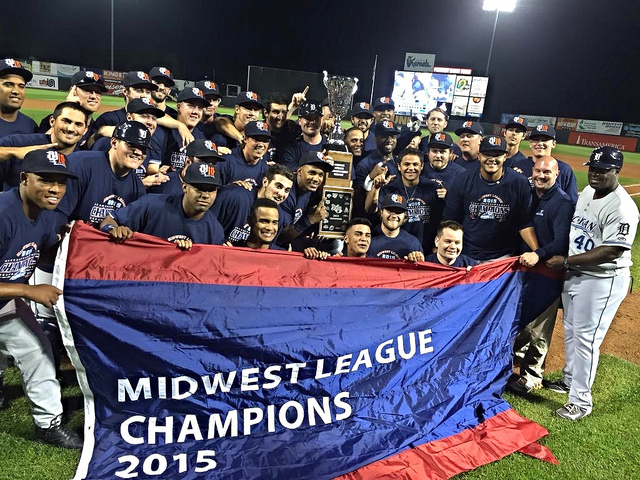 You can read more on their championship win on the Midwest League website HERE. 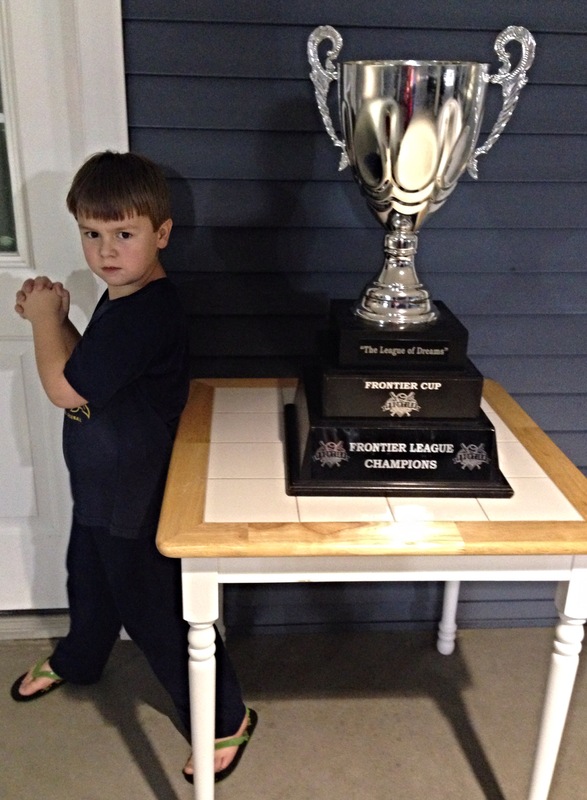 The Beach Bums defeated the River City Rascals by the score of 4-1 last Friday night to win the Frontier Cup. 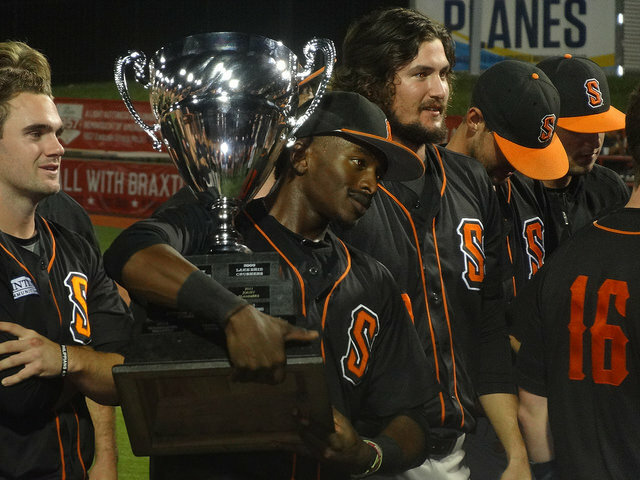 The Bums swept the Rascals 3-0 in the best of five series, and were 6-0 in the postseason. 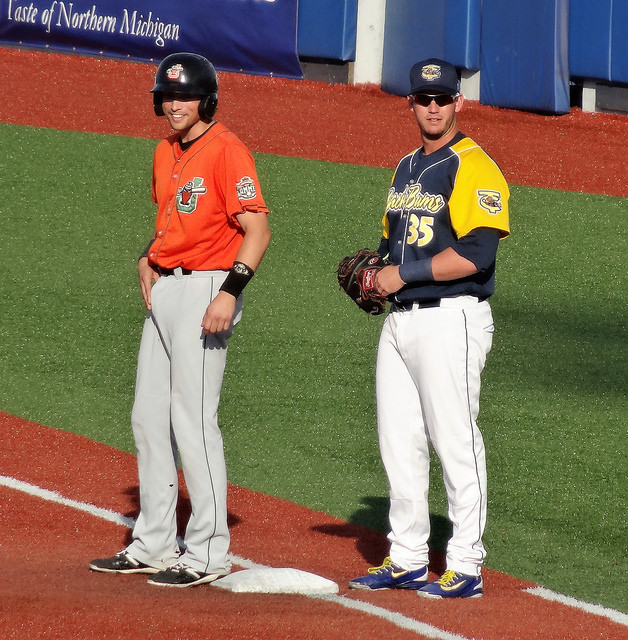 In the ten year history of the ball club in Traverse City, this was the second time making to the finals, being defeated by River City back in 2012. The Bums literally went from worst to first this season, winning a club record 56 games as they advanced to the palyoffs for the fourth time since 2010. 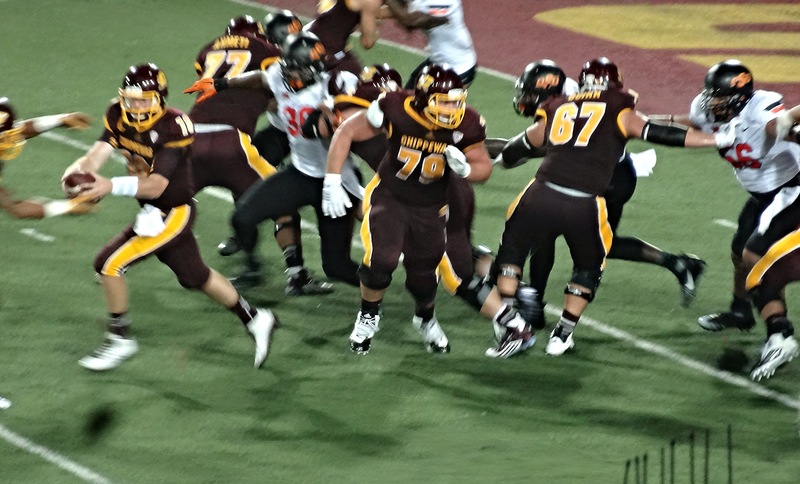 Injuries plaqued last seasons team, including Frontier Cup MVP Jose Vargas. Vargas was also the hero of game two, with a walk-off base hit to give his team a 6-5 win, and complete the comeback when they were down 5-1. Manager Dan Rohn, a Central Michigan alumni, did a great job with the team this season, and I think the Beach Bums are lucky to have a veteran coach at this level. 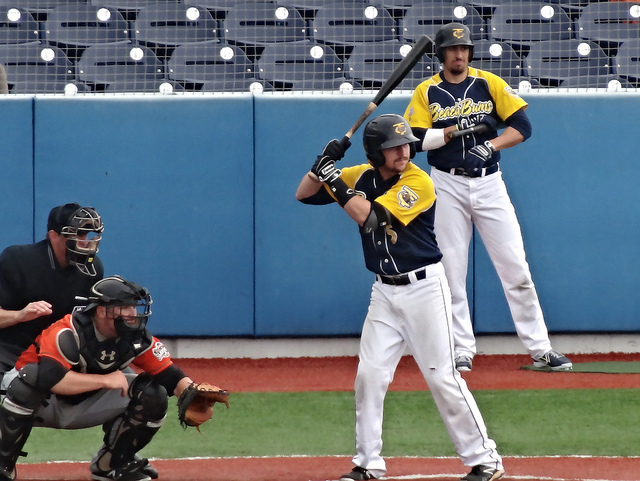 Congrats to the Beach Bums, and were at least able to make it to a couple of games this season, including the last weekend of the regular season that started their nine-game winning streak. 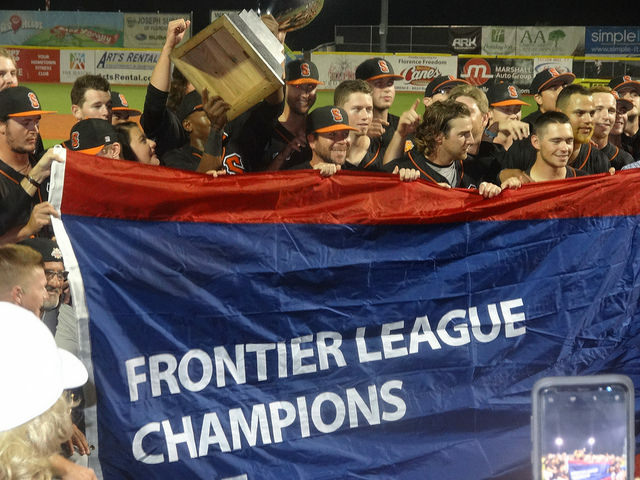 You can read more on the Bums title win on the Frontier League website HERE and at the Record Eagle website HERE. 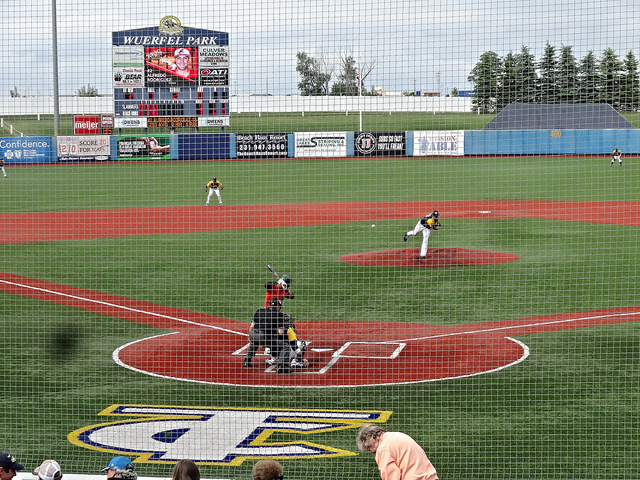 Wuerfel Park- Traverse City, MI: On our way back north, we decided to pass through Traverse City to catch a Beach Bums game. It had been raining most of the day, so we got to the ballpark about 15 before the game when we made our decision to go. I guess all the other Bums fans had the same idea, as there was a huge line for tickets. 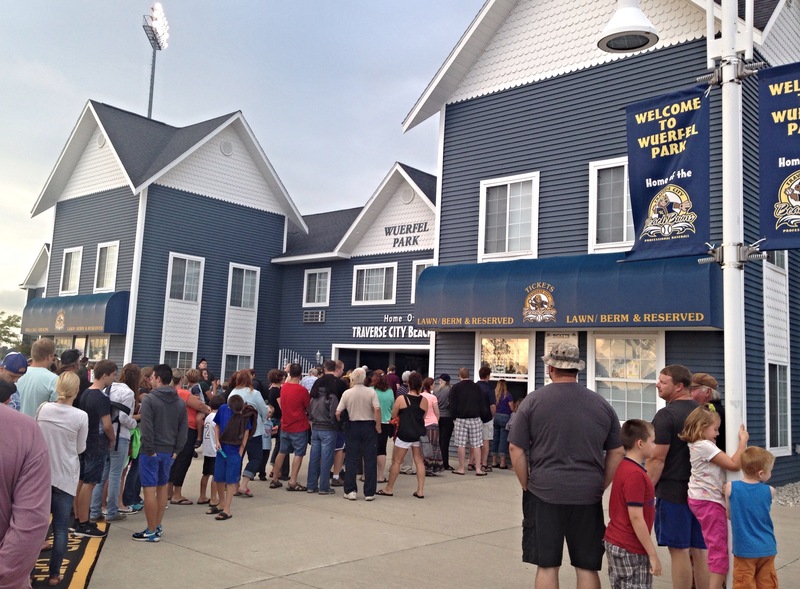 In fact, they finally decided to open a second ticket window about 20 minutes after the game started. In all, we waited almost an hour and missed three innings of the game before we finally set down on the outfield lawn. As you can see above, Trevor and I were just happy to be in the ballpark, while Brian decided to enjoy the game from the playground. I strayed a little to get a few photos, but was called back when some a-hole kid threw sand in Brian’s eyes. 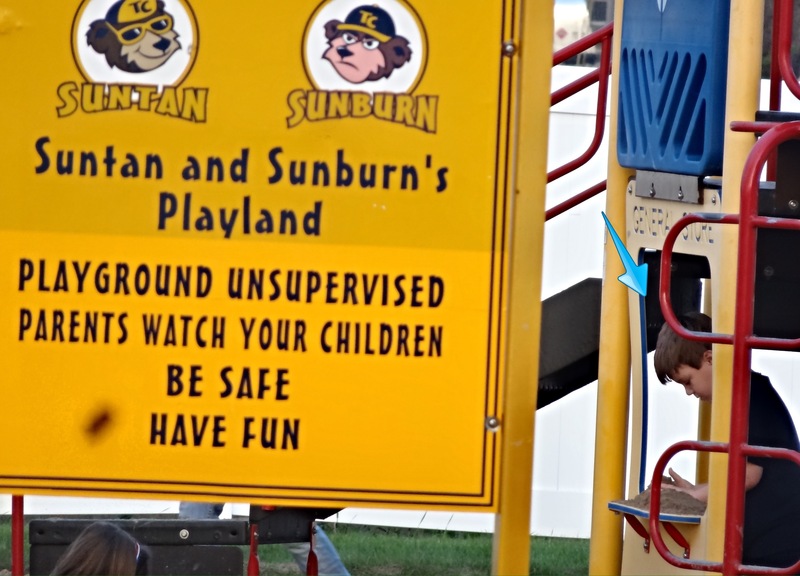 I don’t know why the Bums insist on having sand in the playground. Something like shredded tire would be so much safer and cleaner. 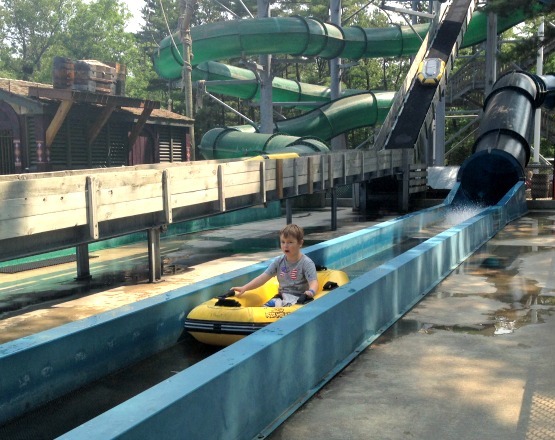 I understand the beach theme, but don’t think it’s as important as safety. Brian was fine, though, as Trevor took care of him. Life is a little easier with a big brother watching your back. 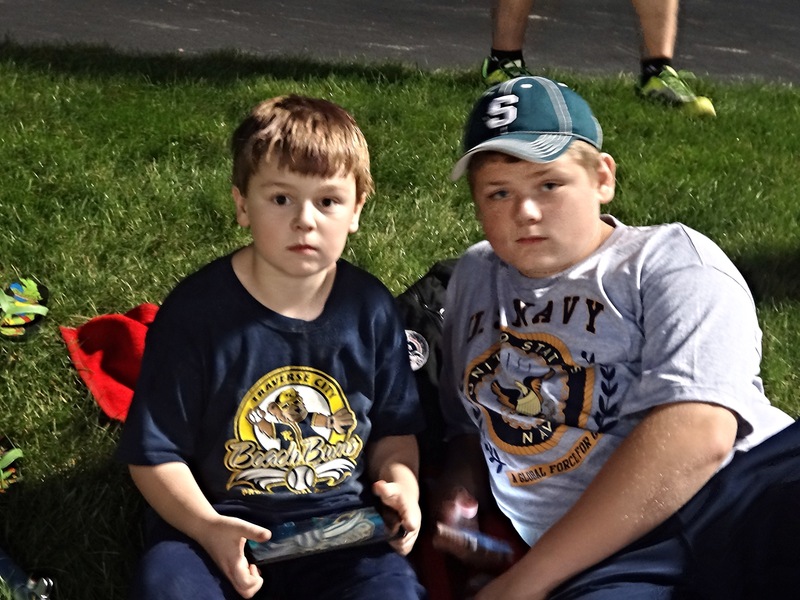 With missing a few innings and the playground drama, it hard to get invested in the game. 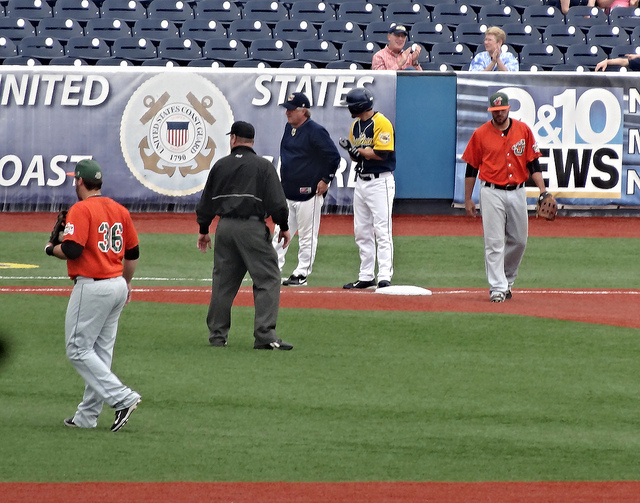 This was a pretty good game, as TC took an early lead (that we missed), and the Greys stormed back to take a 3-2 lead. 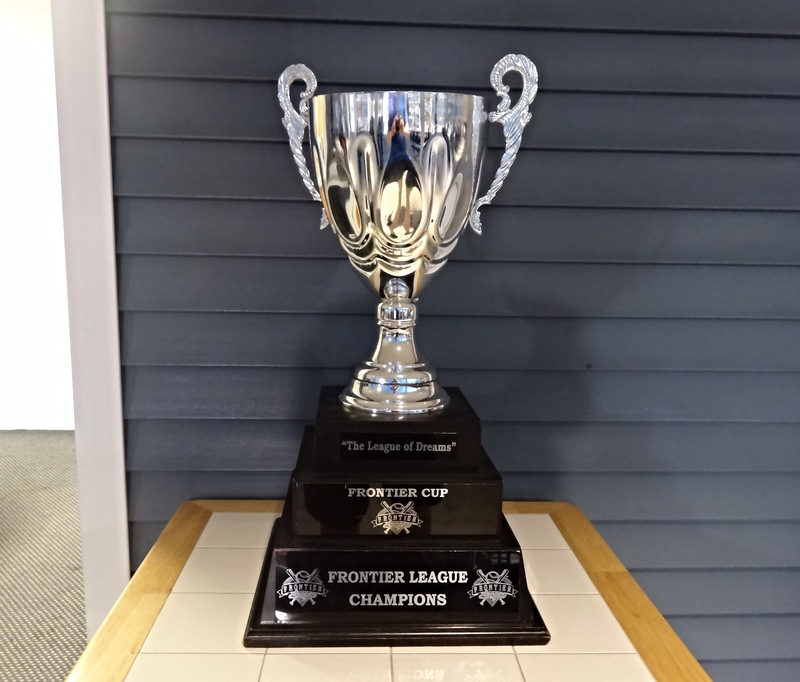 They also had the Frontier Leagues championship trophy, the Frontier Cup, on display so that was pretty cool. With the Bums down by a pair in the ninth, we took seats in the lounge chair section. 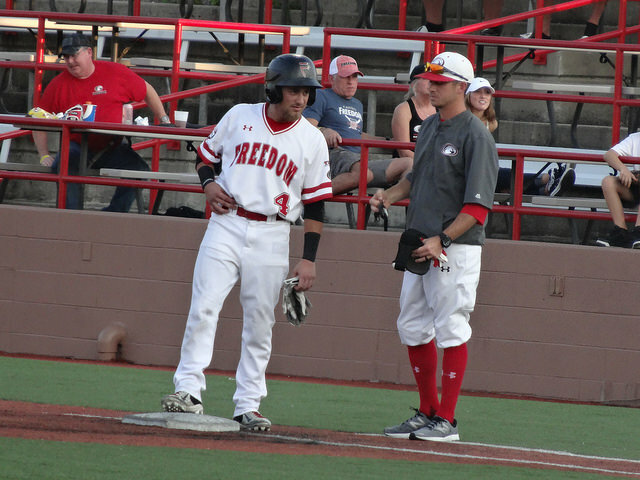 The game finally got interesting when they tied it up at four on a double by Jake Rhodes. 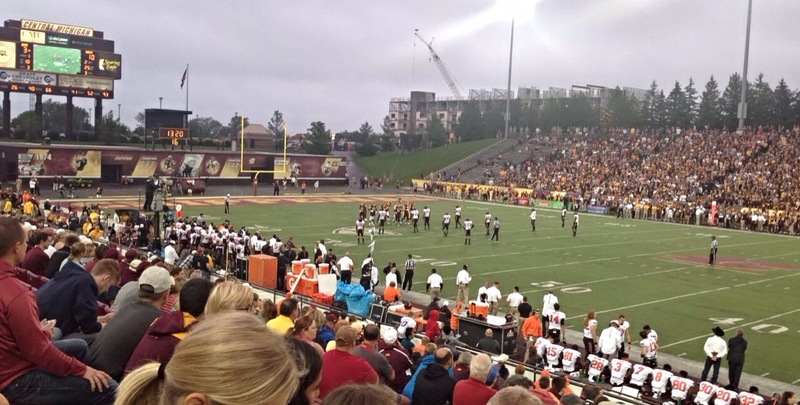 Also over Labor Day weekend we caught some football, as the Central Michigan Chippewas hosted the Oklahoma State Cowboys in Mt. Pleasant. 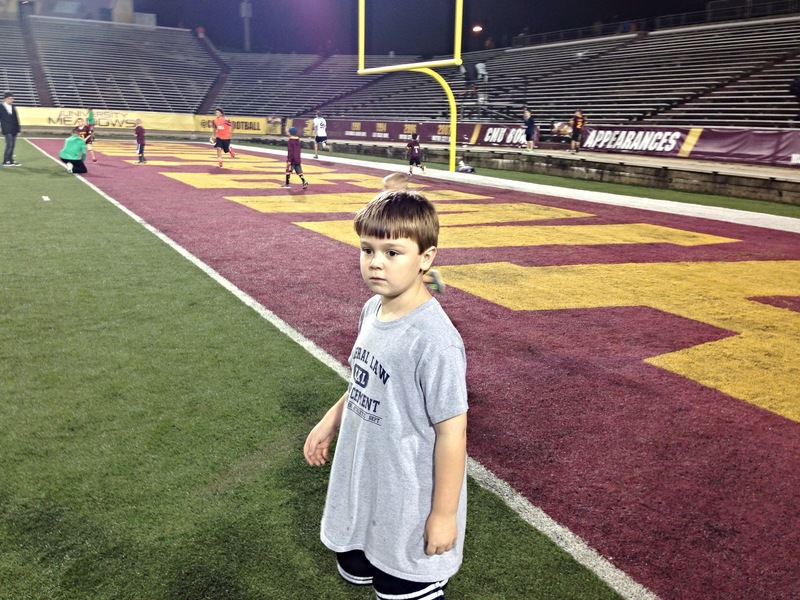 The Chips fell 22-13, but we had a fun night and at least it didn’t rain during the game like it did all day. 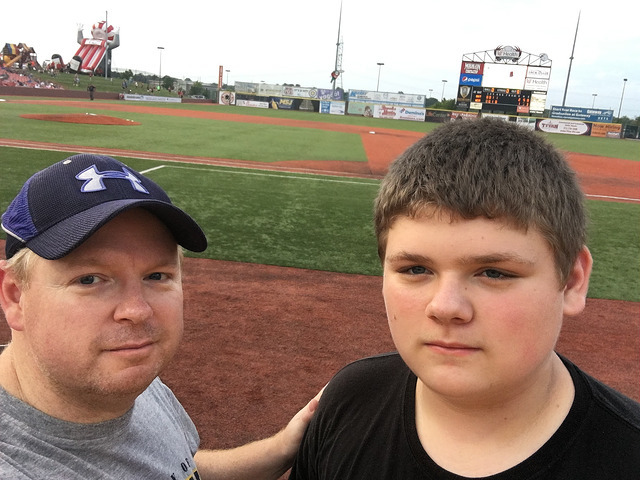 Wuerfel Park-Traverse City, MI: The summer of rain continues, but we didn’t let it ruin our baseball fun over the weekend. 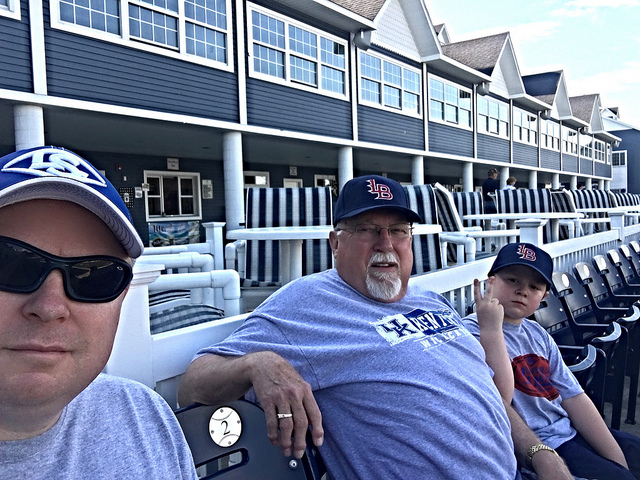 Although it rained most of the weekend, the weather cleared up enough to take in our first Beach Bums game of the season. 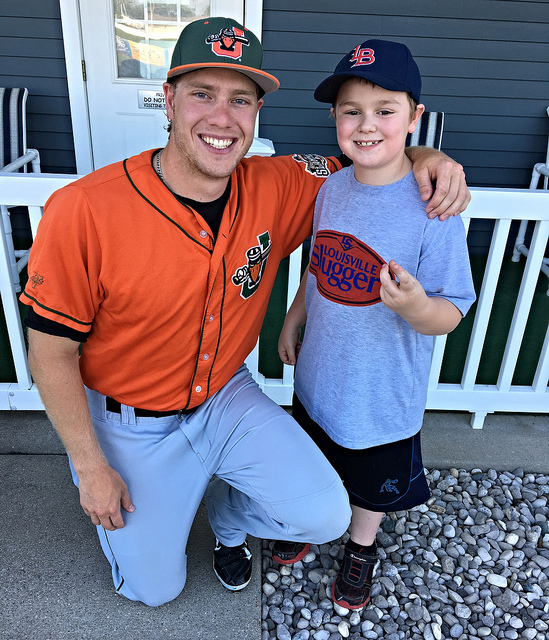 Our experience started off on a good note, as Brian got a game ball from the Joliet Slammers before the game even started. 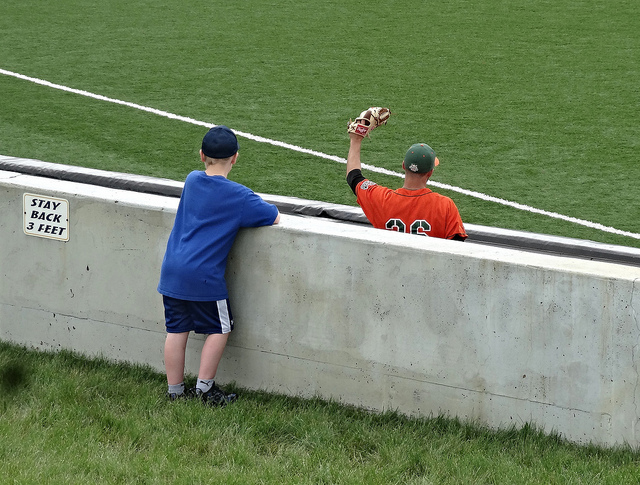 I guess it’s good to make the right friends, as he was chatting with the guys in the bullpen. The game was a good one for the home team. 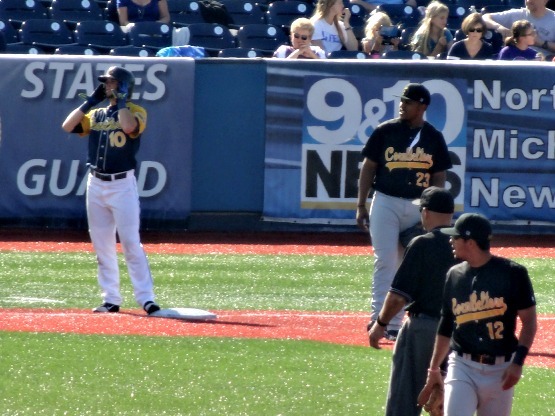 The Bums scored three runs in the second inning, and never looked back on their way to victory. 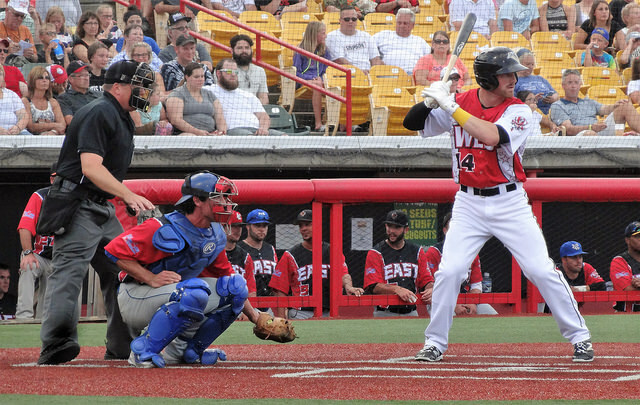 Offensively they were led by Jay Austin, who had four hits and was just a home run shy of hitting for the cycle. 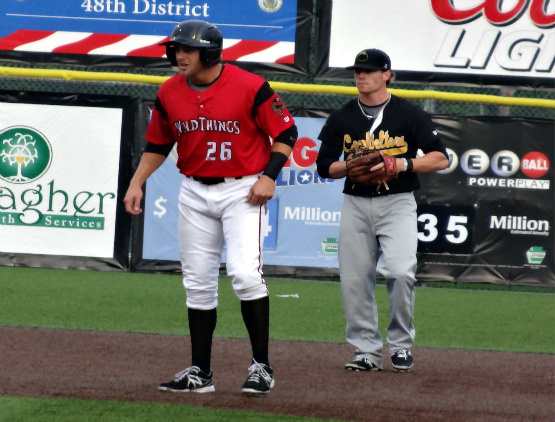 Jeff DeBlieux pitching in with a triple and 2 RBI’s, while Jake Rhodes and Greg Harisis each had hits. 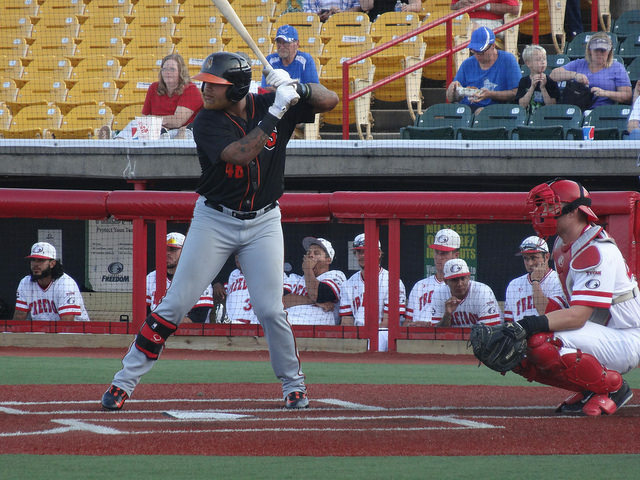 In the fifth inning, Graham Ramos hit and RBI single, and then scored on a double by Yazy Arbelo. 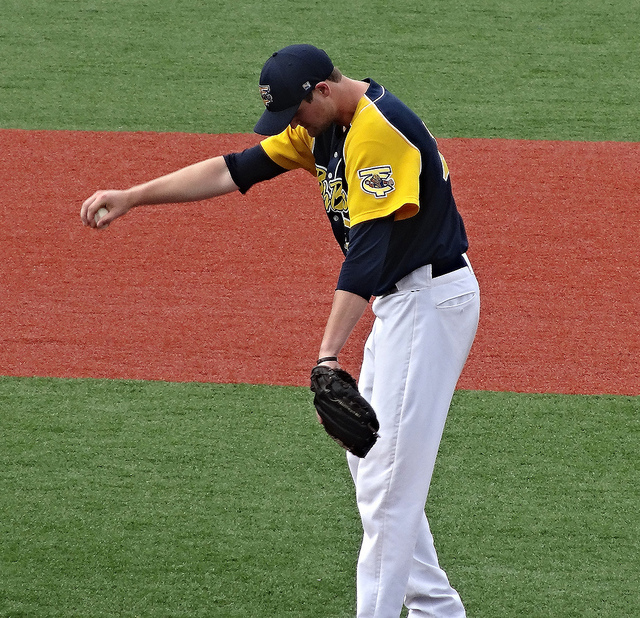 On the bump, pitcher Kramer Champlin threw seven strong innings for the win, allowing four hits and no runs. 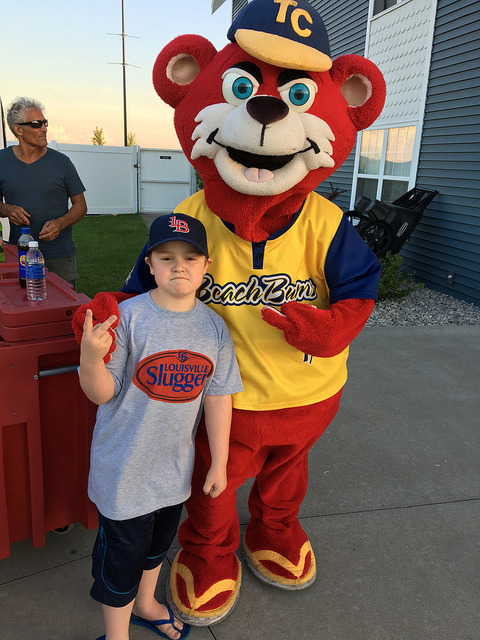 Final score: Beach Bums 5, Slammers 1. 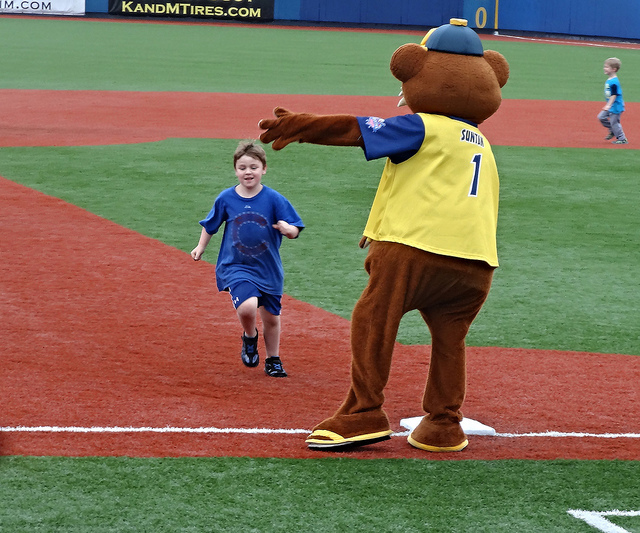 After the game, Brian was able to run the bases of Wuerfel Park. 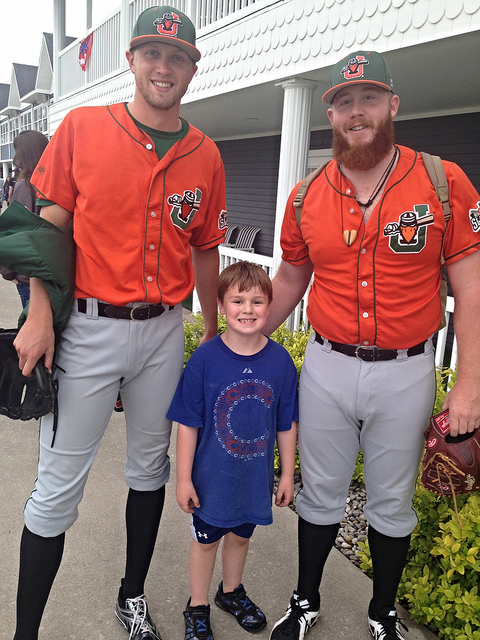 After he ran the bases, he met up with a couple of the Slammers players to thank them again for the baseball. He was going to stand in line for the Beach Bum autographs, but he was tired and we still had a long drive ahead of us. This was a fun game, and the impending rain kept it a very small crowd. We were lucky that the rain held off for us, and I’m hoping to get back to TC soon. It’s a good ballpark to visit since one our way down state one way or another. 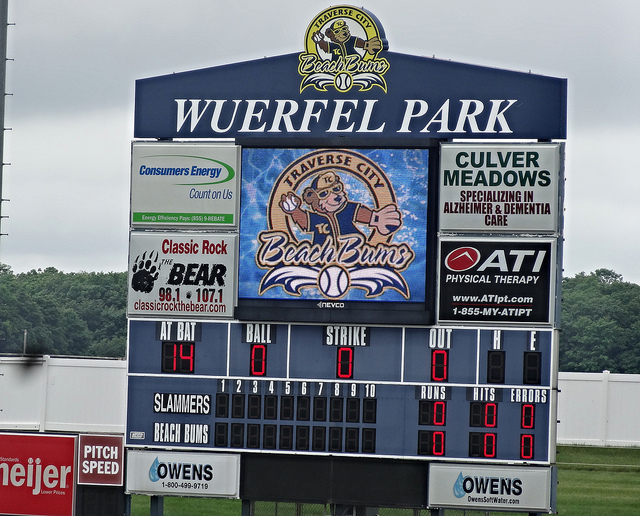 Weurfel Park-Traverse City, MI: It was time for the kids and I to make a trip to Traverse City for some fun and baseball. 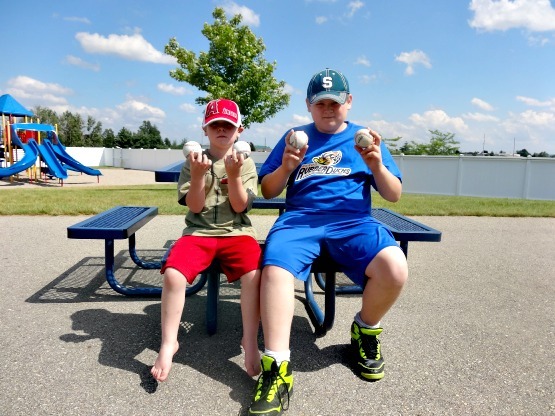 We hit the Beach Bums game early, so the boys were able to search the outfield and found four baseballs from batting practice! We still have some time before the game, so we were able to watch some warm-ups and the boys got to visit with their Nana. 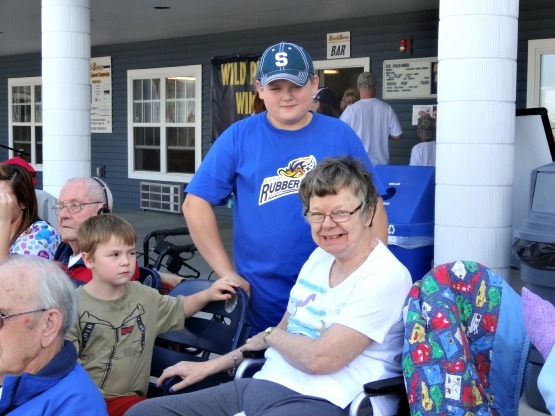 She doesn’t make it to too many games anymore, so it was a special day to have her there. The game itself was a good one for the home team Beach Bums. 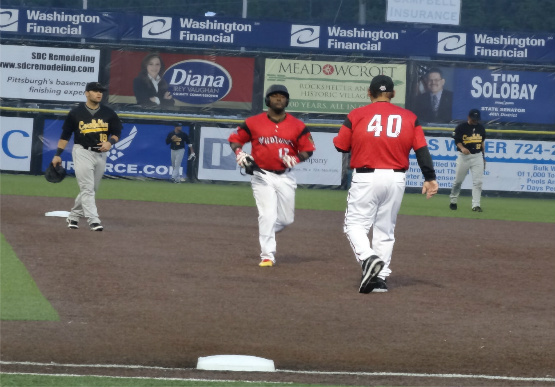 They got off to a good start, as Sean Gusrang hit a two-run homer to put the Bums up 2-0 in the first. 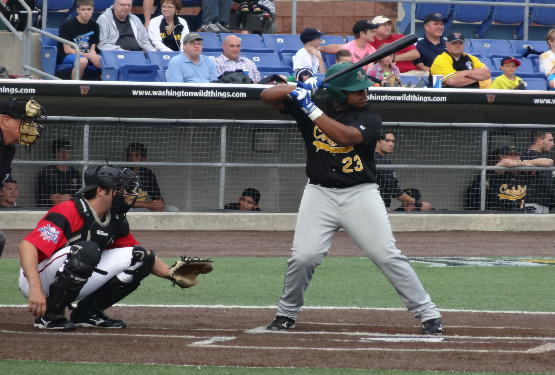 The rally was continued by Yazy Arbelo, who doubled, and was hit home by a Jovan Rosa two-bagger. On the mound for TC, Alex Phillips earned the win, striking out three and only giving up six scattered hits. 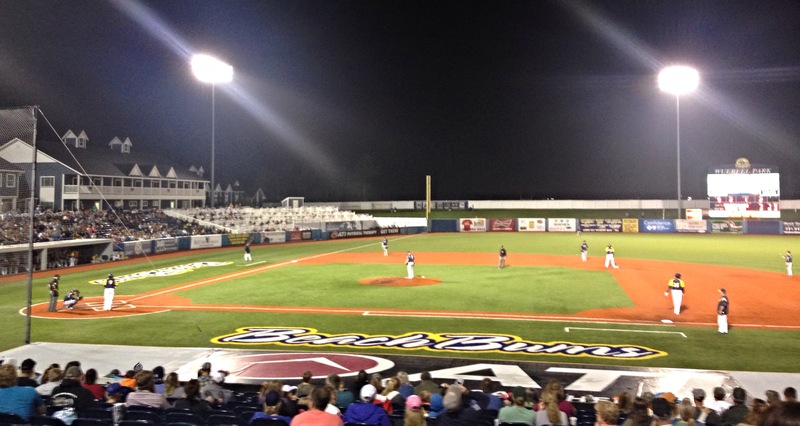 Final: Beach Bums 4, CornBelters 0. 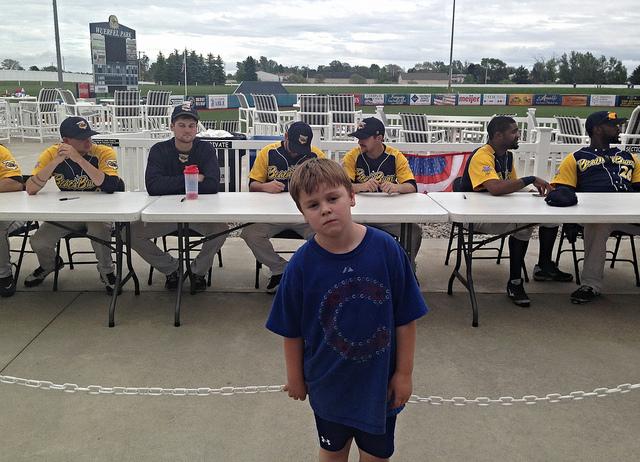 After the game, Brian didn’t feel like running the bases, but the boys lined up for autographs from the team. 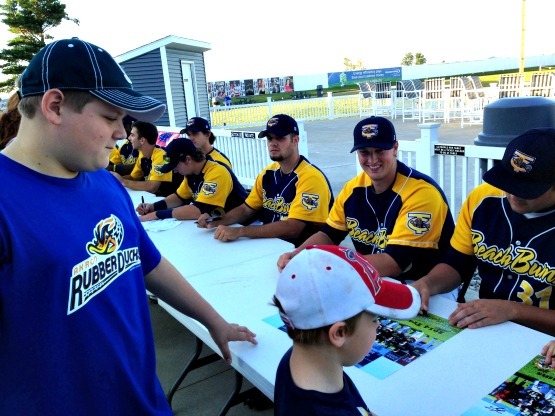 The Beach Bums give the kids a free team poster to get signed. 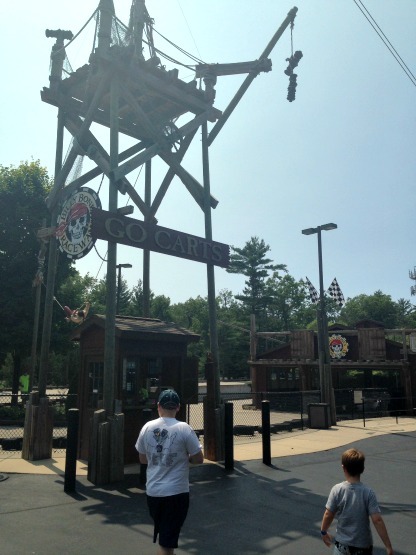 While in Traverse City, we also had time to visit one of our favorite summer hang outs, Pirates Cove. 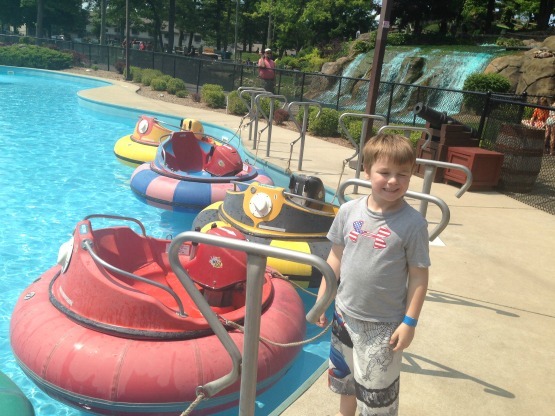 The kids and I took part in some go-cart races, bumper boats, and the water coaster. Sometimes I think we just have too much fun together, but feel lucky and blessed to have this time with my kids and family! 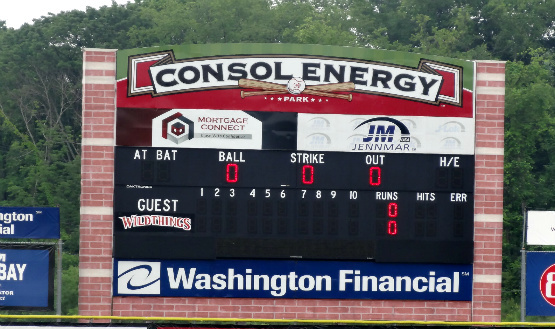 Consol Energy Park-Washington, PA: After our trip to see some Cy Young stuff, we made our way to southern Pennsylvania to see the Washington Wild Things host the Normal CornBelters in Frontier League action. 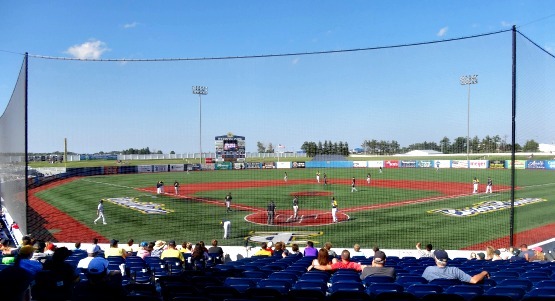 This is the first Frontier League ballpark we’ve been to outside of Traverse City. 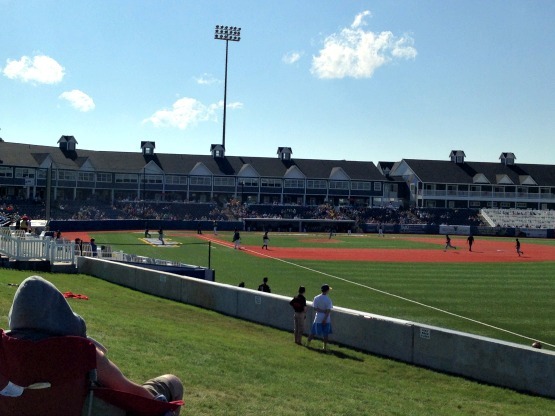 Consol Energy Park is a very nice ballpark to watch a game, also. The parking and entrance is in the right field area, so really no one was at the front of the stadium when the gates opened. 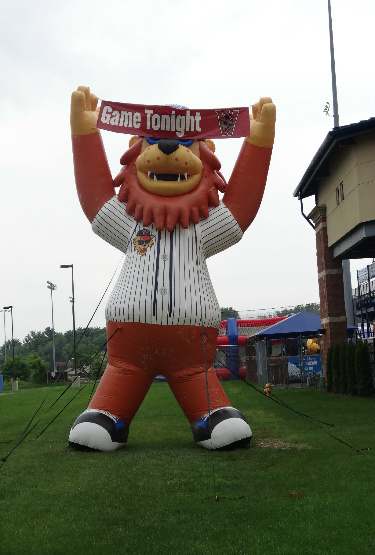 I’m also glad that Wild Thing was at the front of the stadium, also, to let fans know that there was a game. 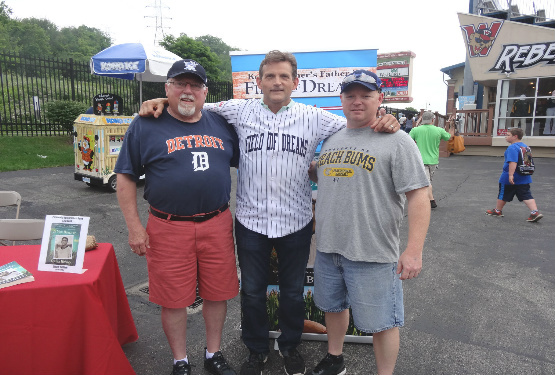 While exploring the ballpark, we had a nice surprise, in meeting actor Dwier Brown, who played John Kinsella (Kevin Costner’s father) in the movie Field Of Dreams. 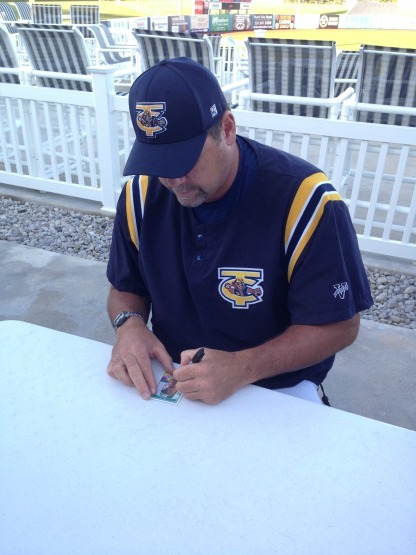 Brown was at the ballpark selling his own book, If You Build It…, and signing copies for fans. We did buy a copy, and he was nice enough to sign it and get a photo with us. 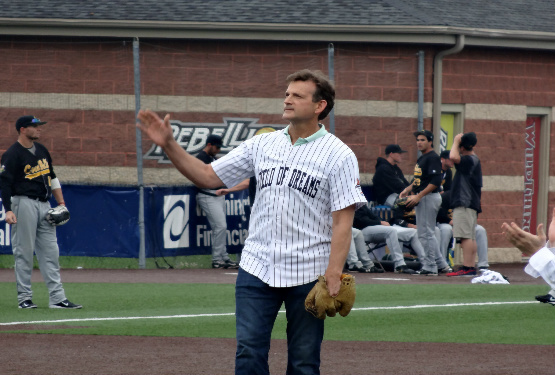 He also threw out the first pitch to start the game. In the time it’s taken me to finally get this post up, I have read the book and it’s very good. You don’t even have to be a fan of the movie or baseball to enjoy it. 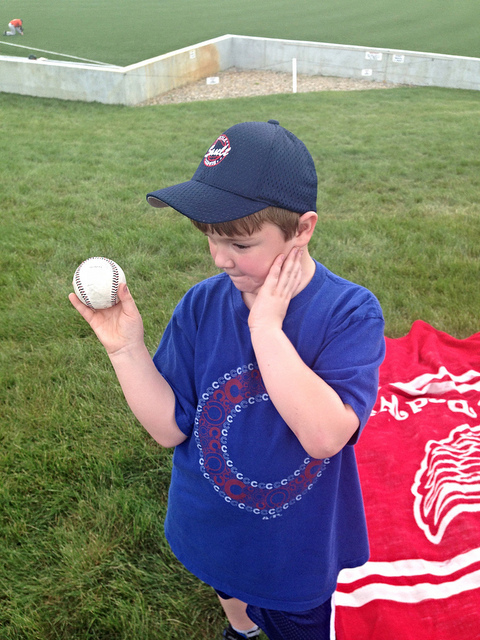 He also thought it was pretty cool that we were at the Field of Dreams movie site a few years ago, too. We still had plenty of time to watch the teams warm up, and take some photos of the ballpark. 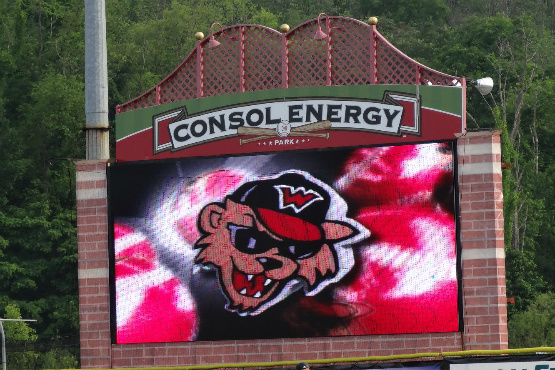 I did notice that Consol Energy Park has the same artificial surface as the Beach Bums’ Wuerfel Park. The Wild Things also had a pre-game ceremony with members of the Make-A-Wish Foundation that was very nice. We got our shopping done, too, and I have to say Washington’s merchandise is priced well. I got a pennant and a Wild Thing plush for Brian. 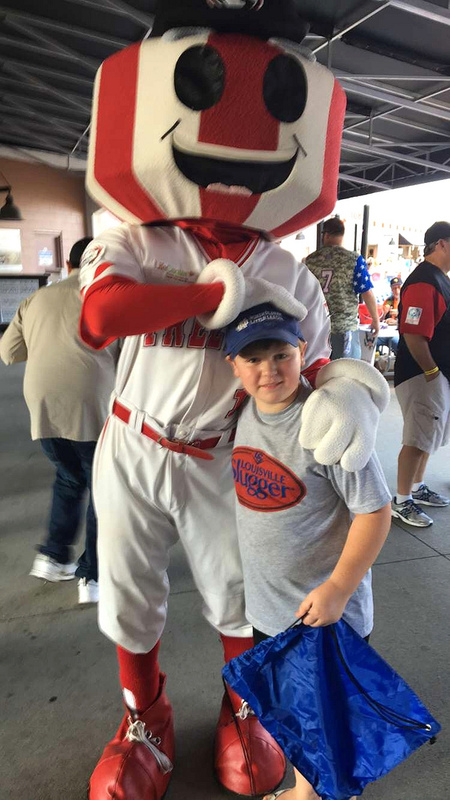 The mascot, simply named Wild Thing, made his presence known, but we really didn’t see him too much around the concourse during the game. The game itself was another ugly one for the home team. 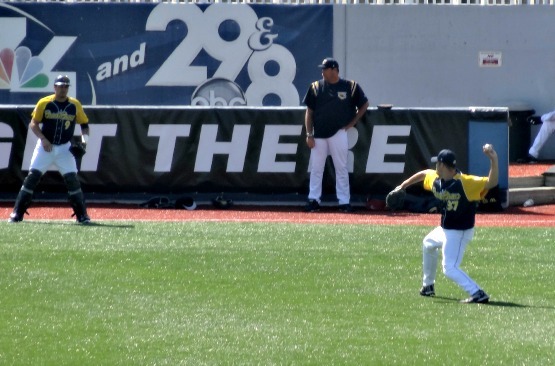 Left fielder C.J. 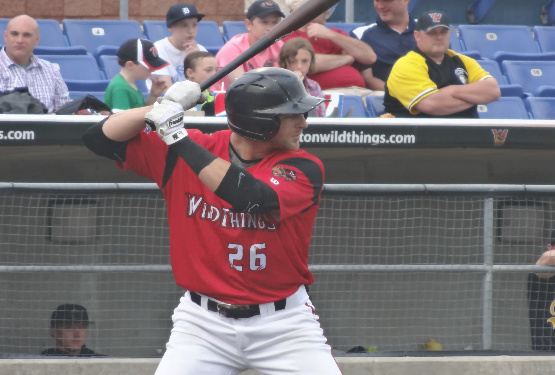 Beatty did have a nice night at the plate for the Wild Things, though, going 3-3 with three RBI’s on two home runs. 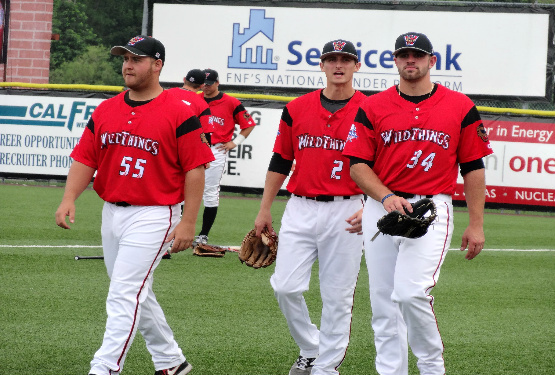 On the mound, Alex Kaminsky took the loss for the Wild Things, throwing five innings, and giving up five earned runs on eight hits. 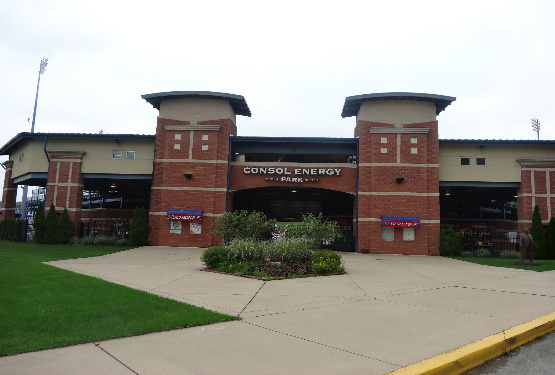 In all, though, Consol Energy Park is a nice place to watch a game, without a bad seat in the house. 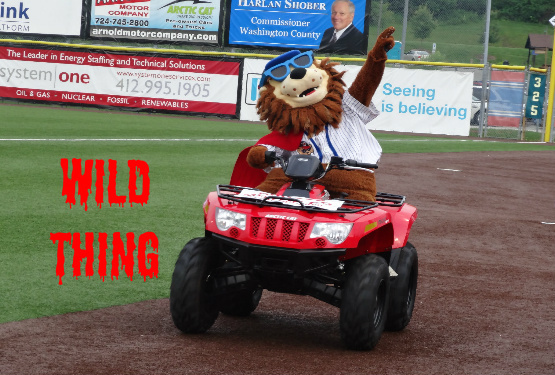 Final: Wild Things 4, CornBelters 9.